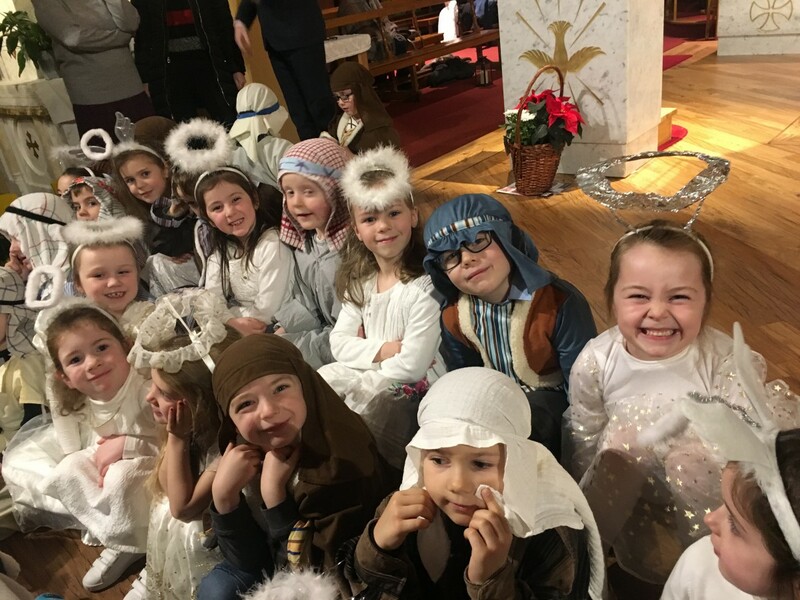 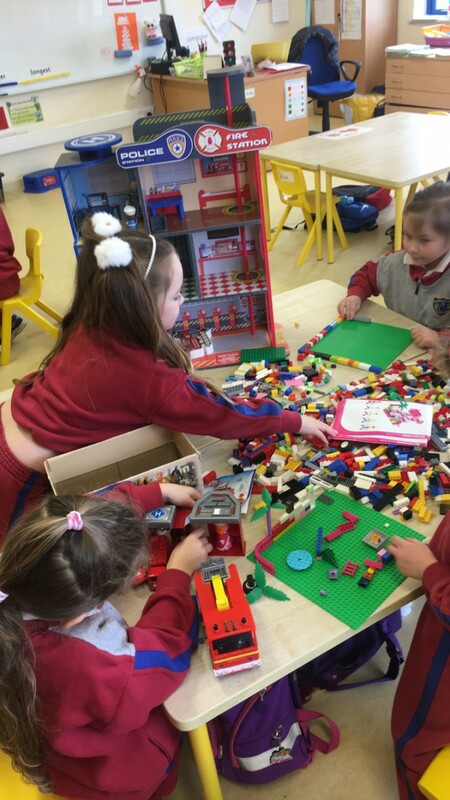 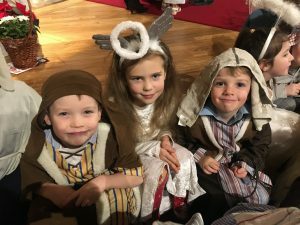 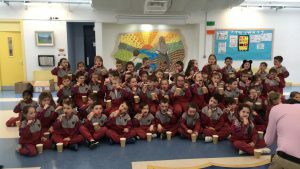 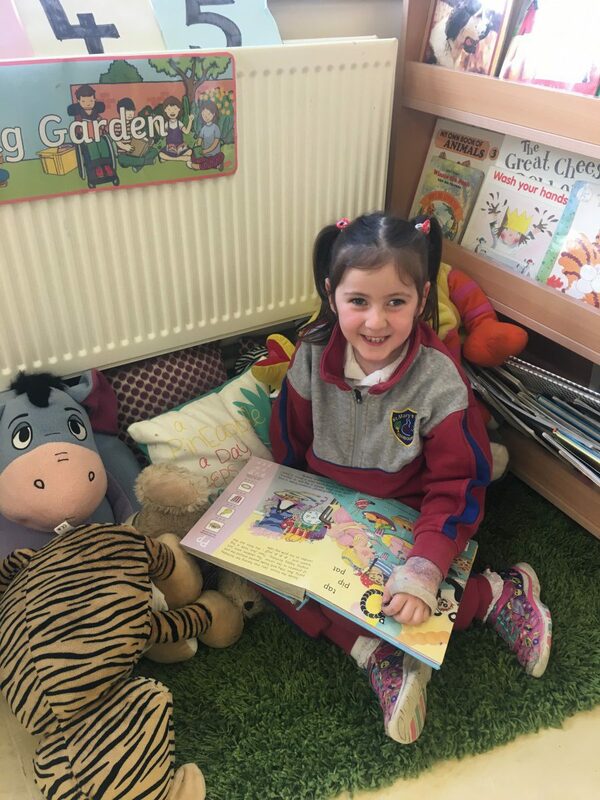 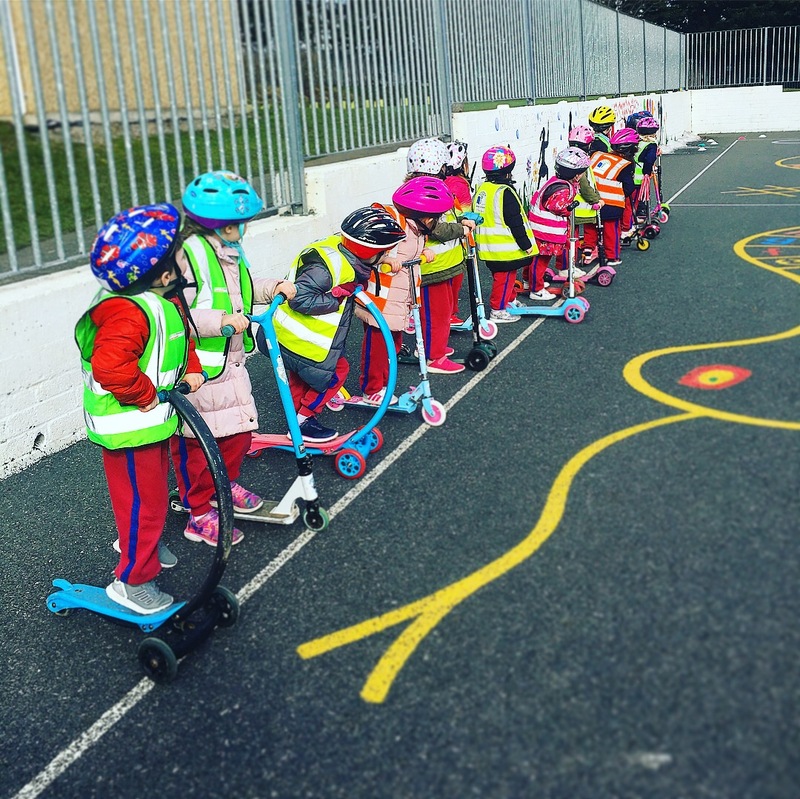 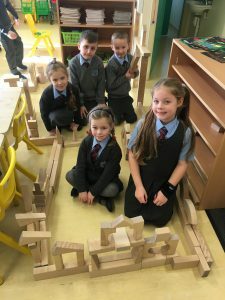 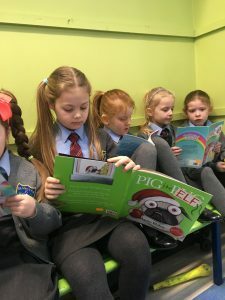 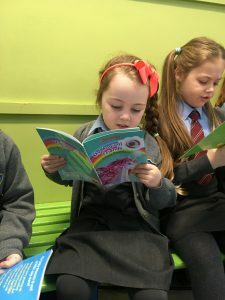 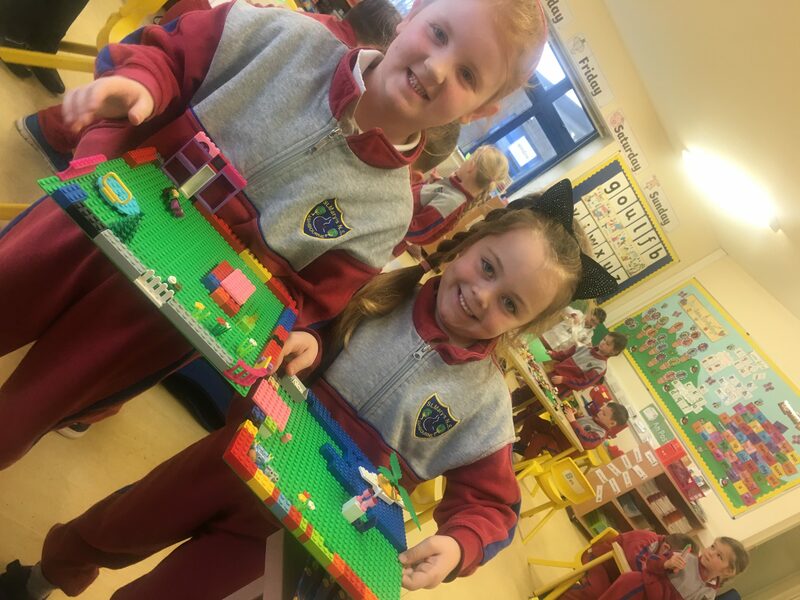 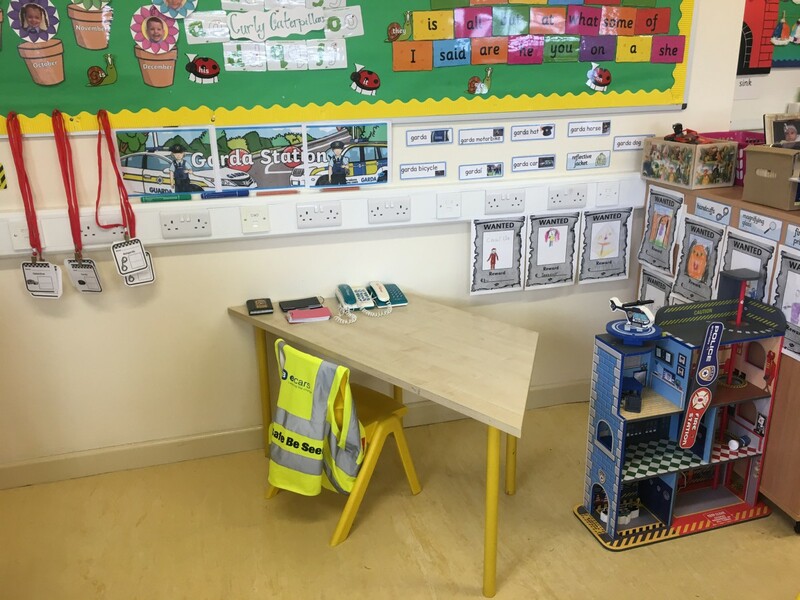 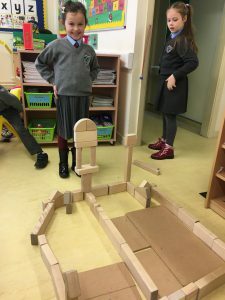 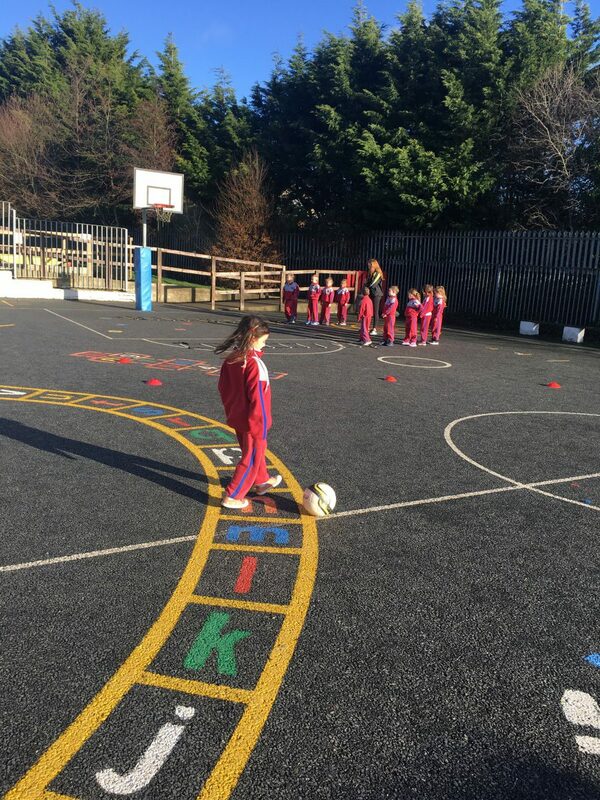 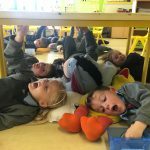 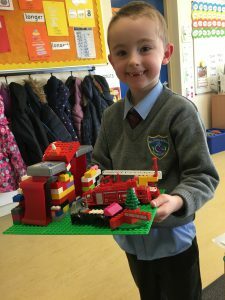 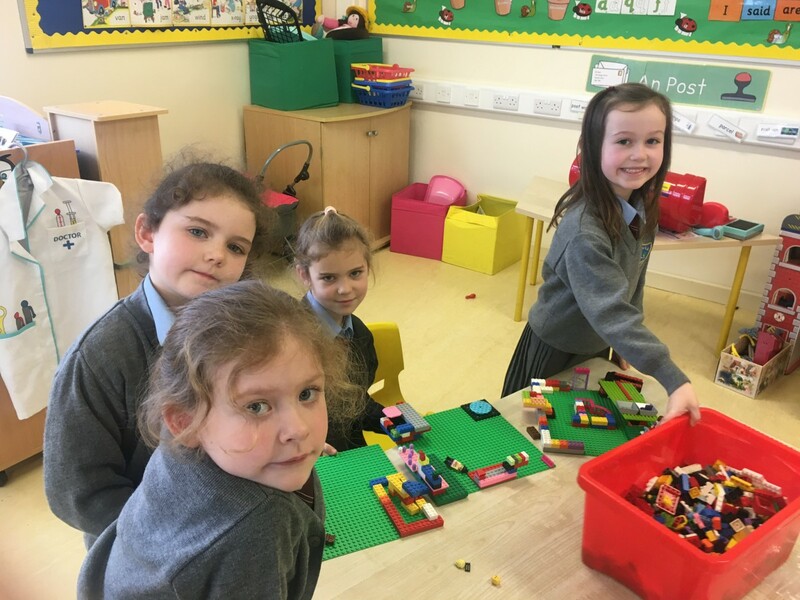 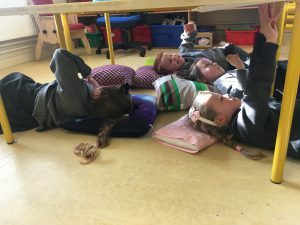 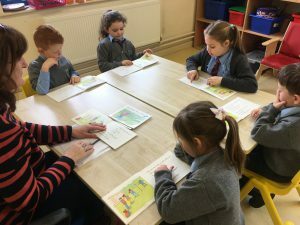 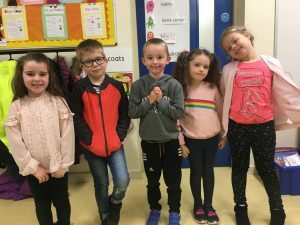 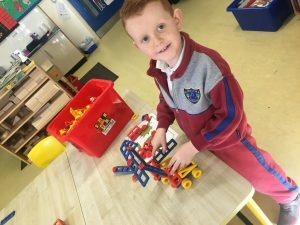 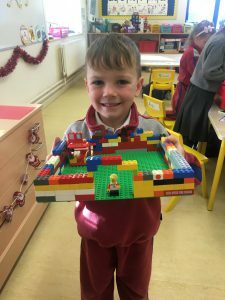 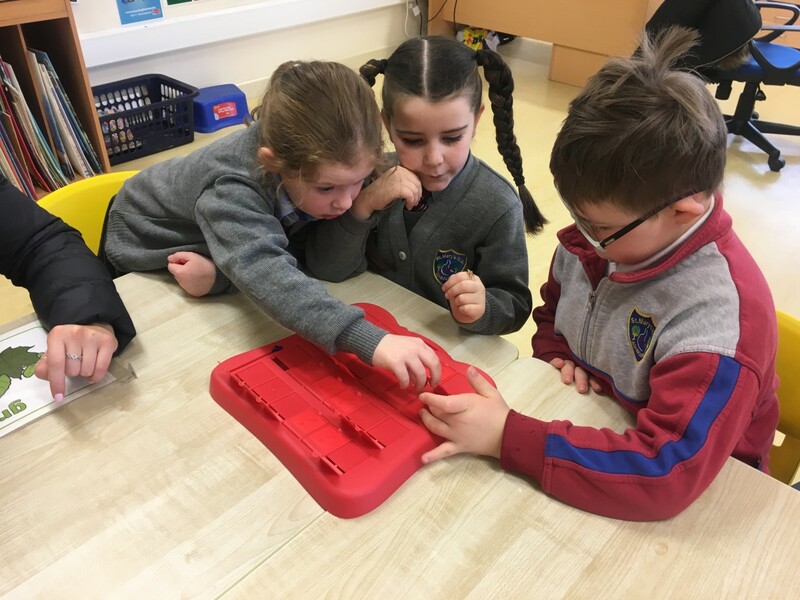 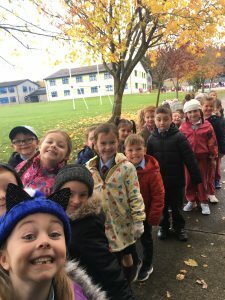 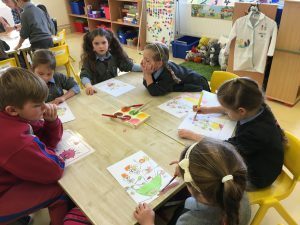 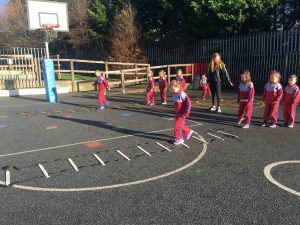 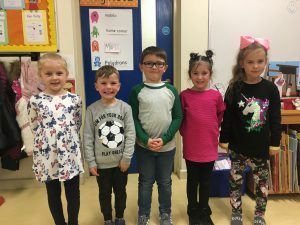 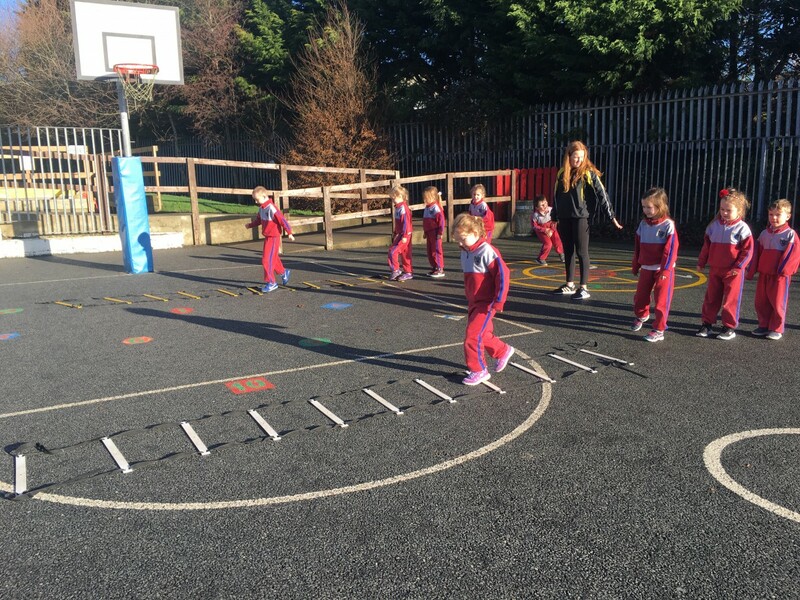 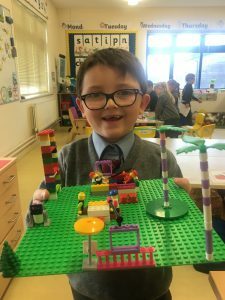 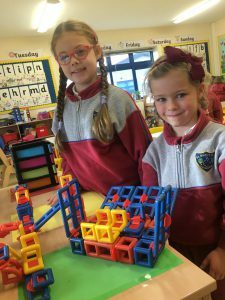 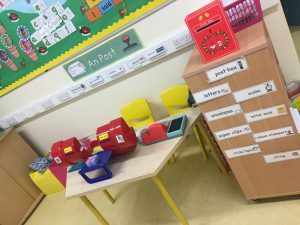 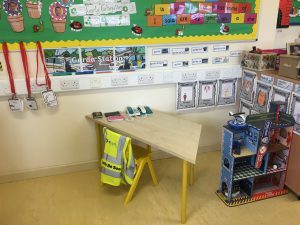 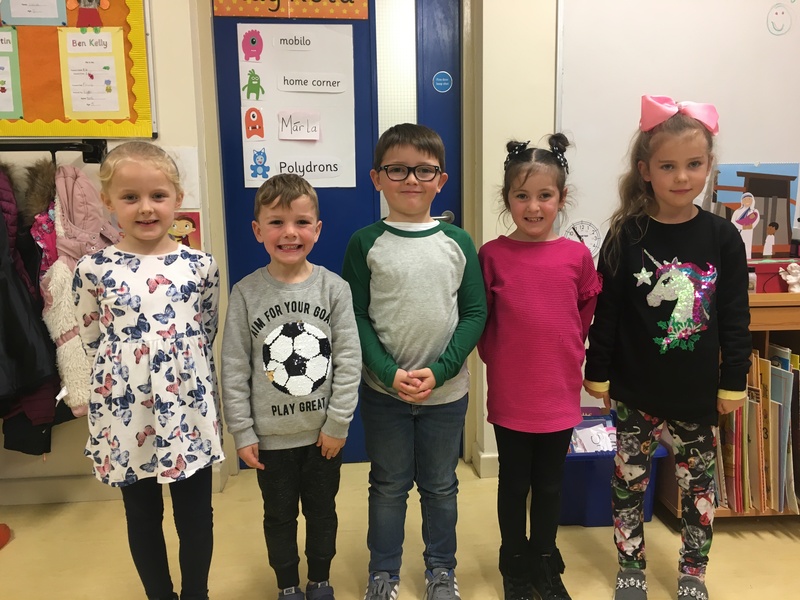 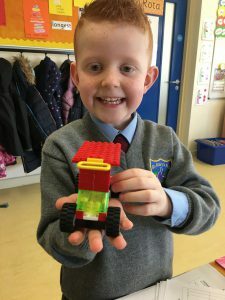 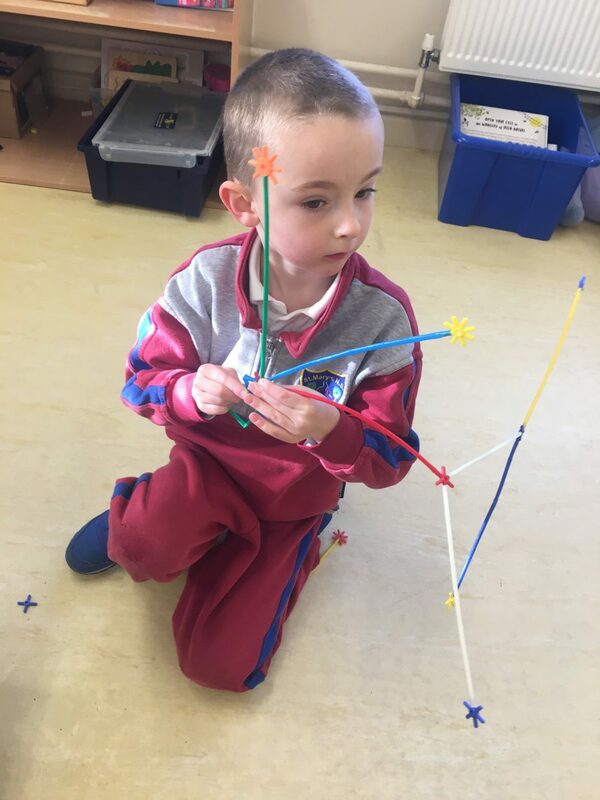 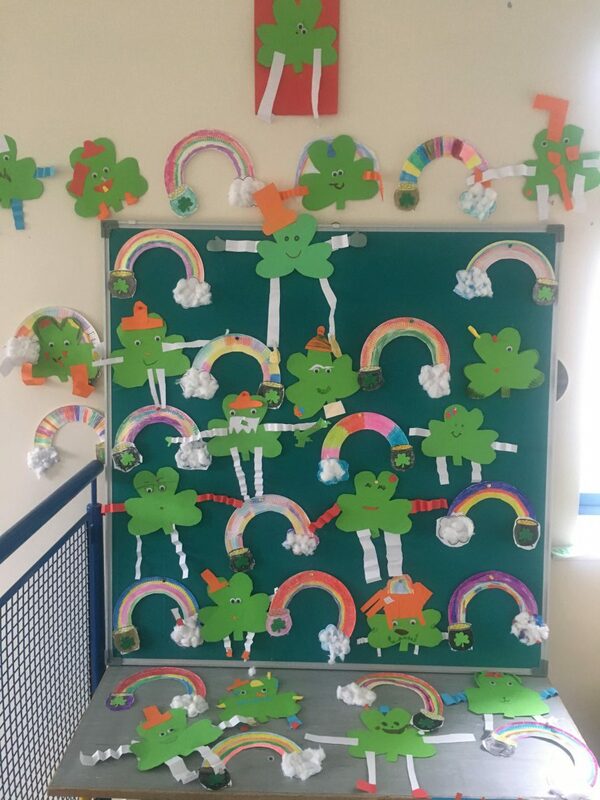 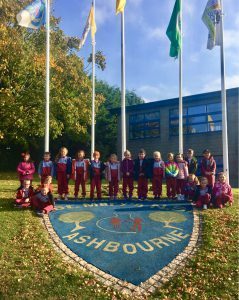 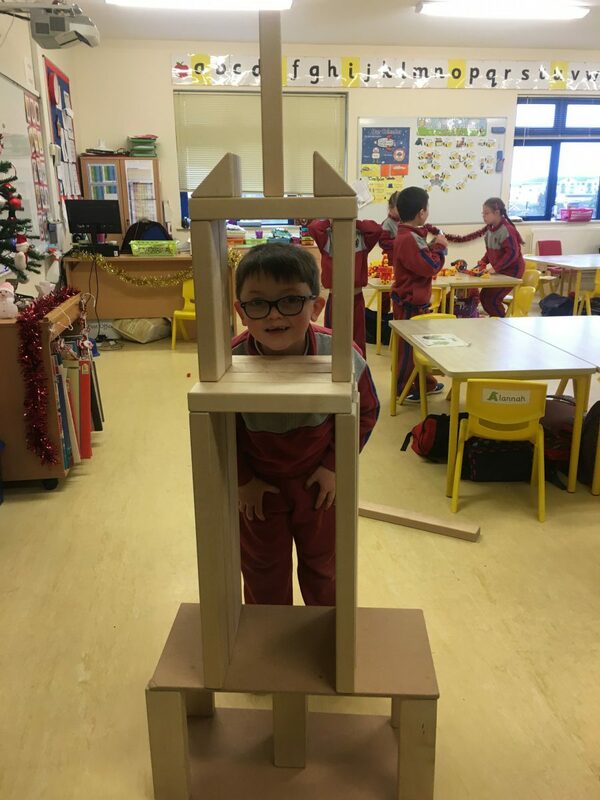 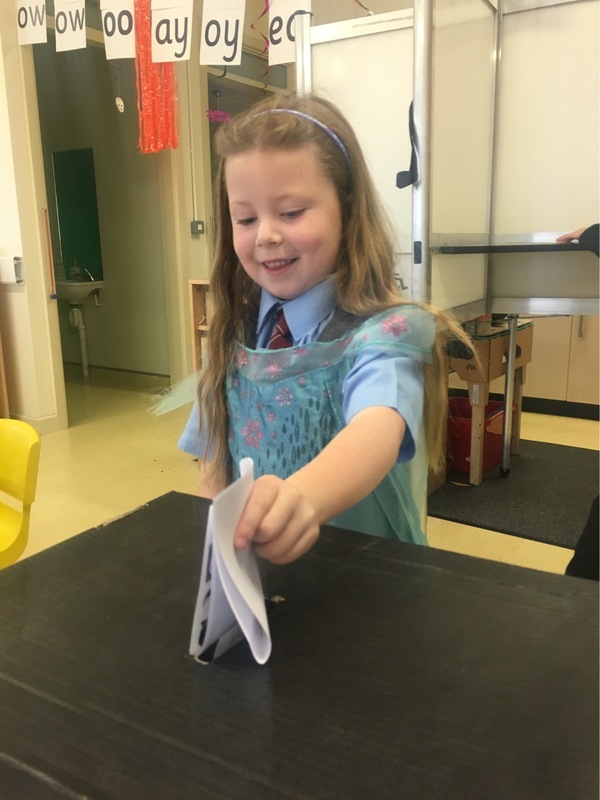 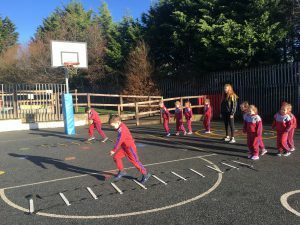 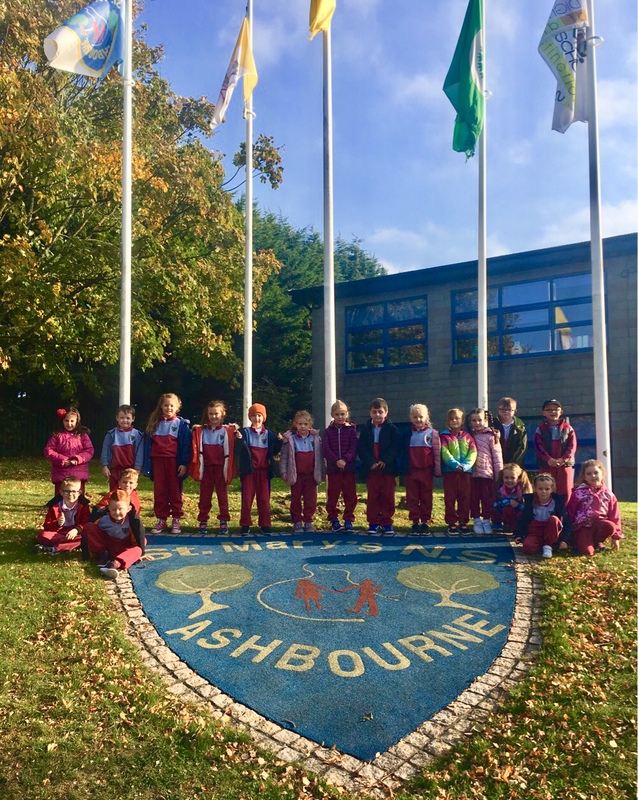 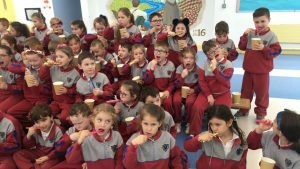 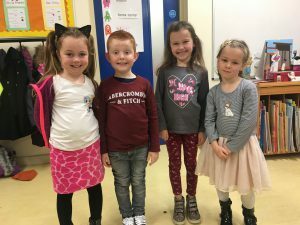 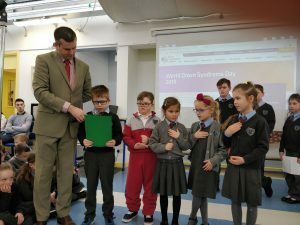 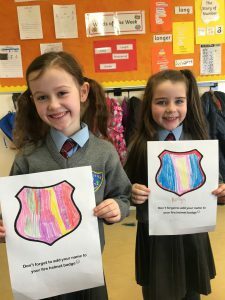 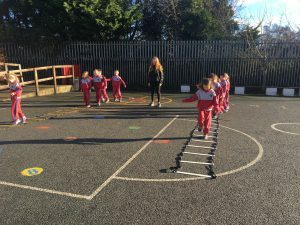 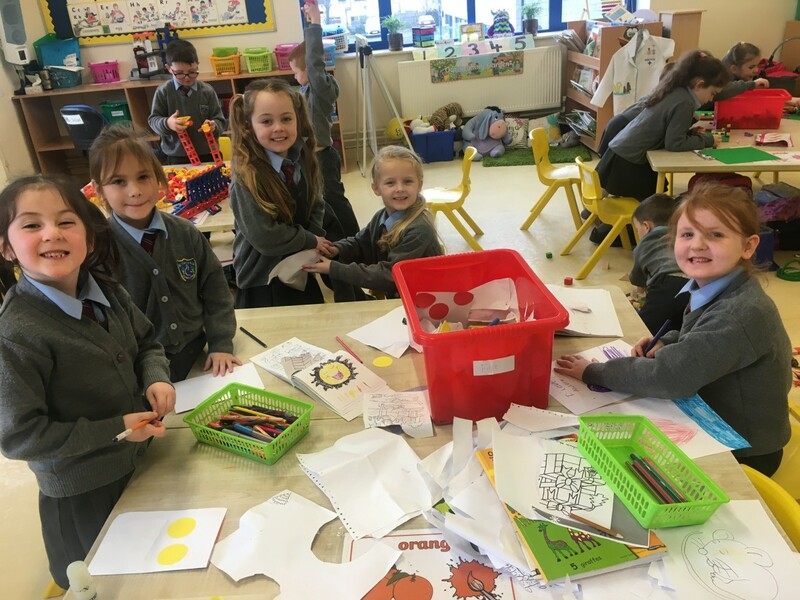 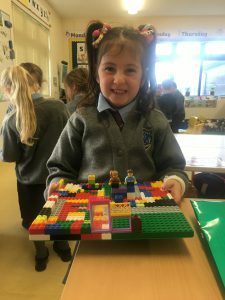 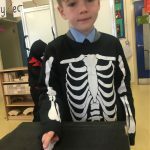 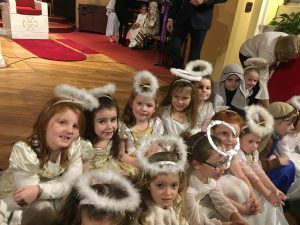 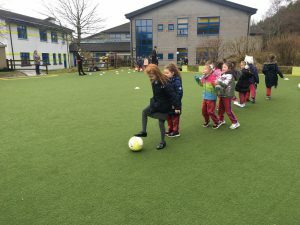 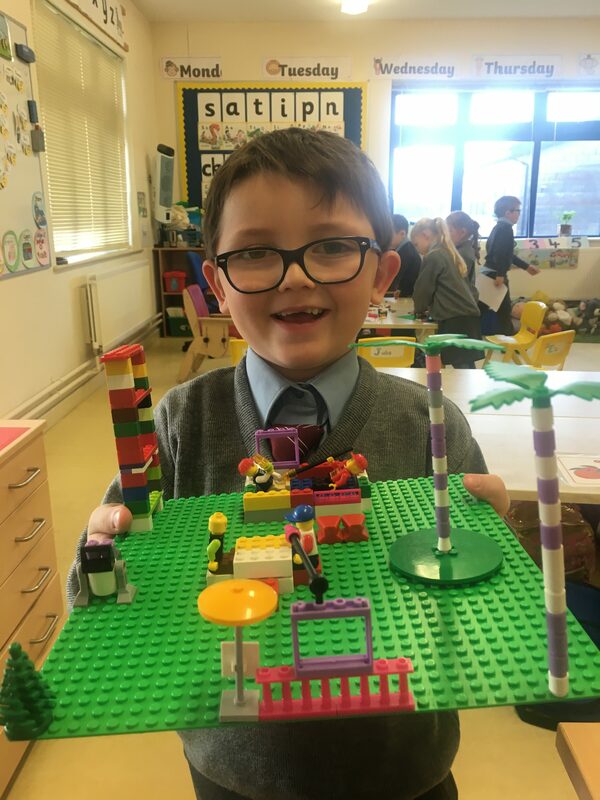 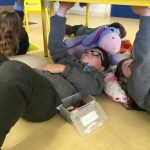 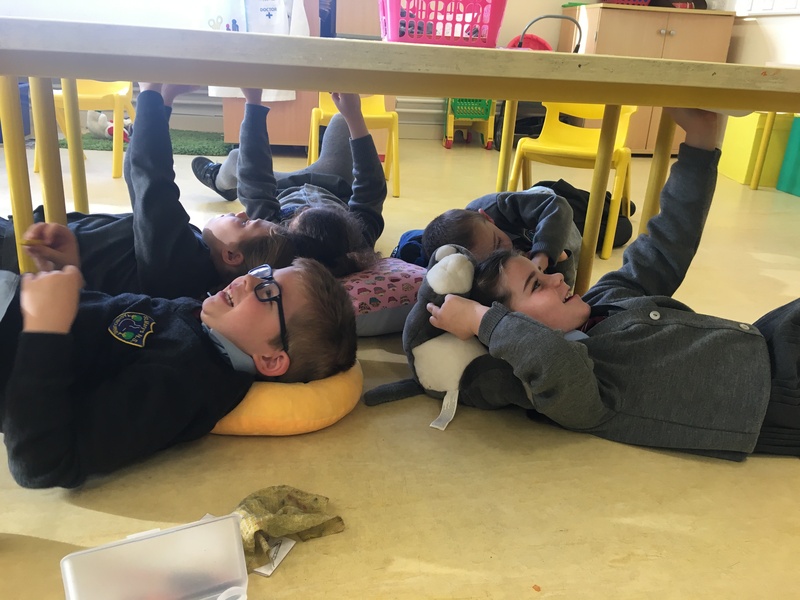 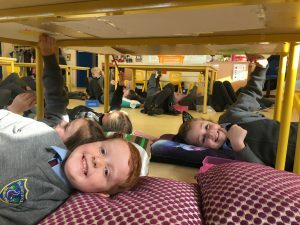 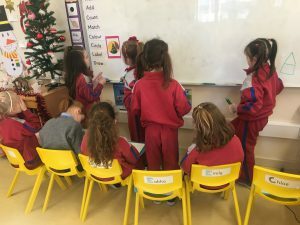 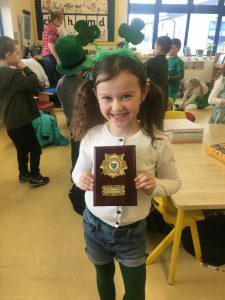 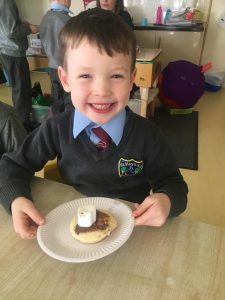 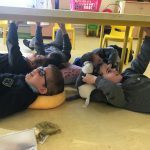 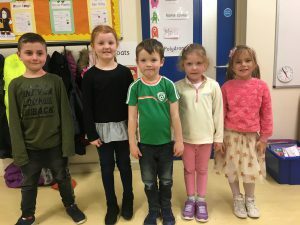 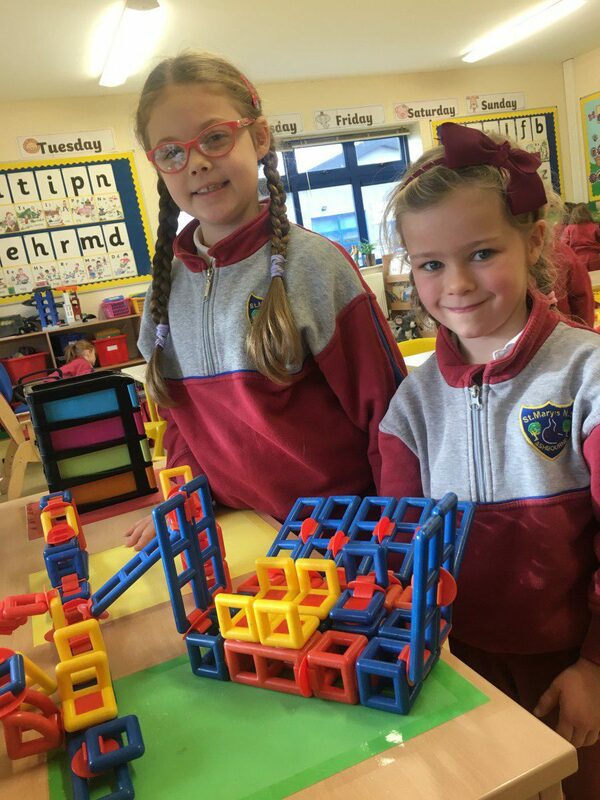 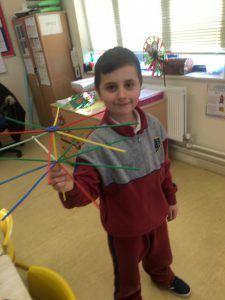 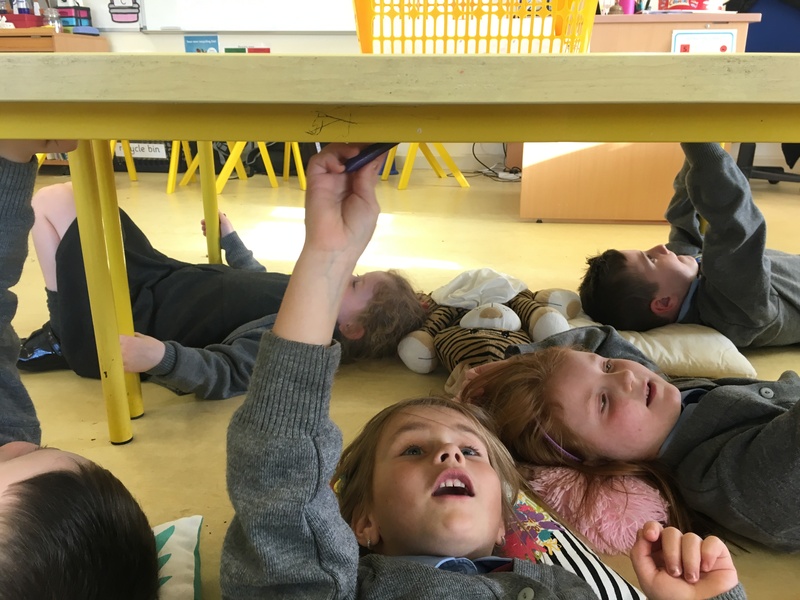 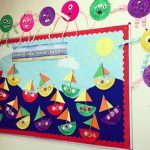 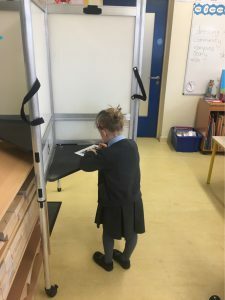 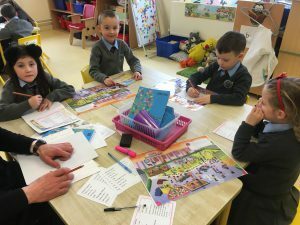 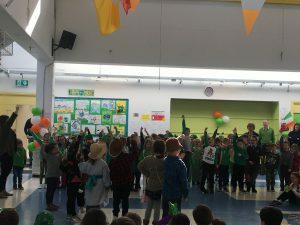 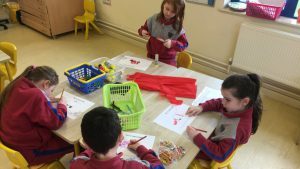 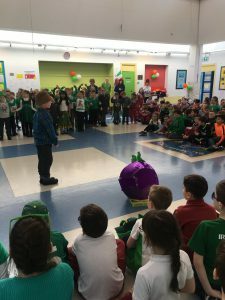 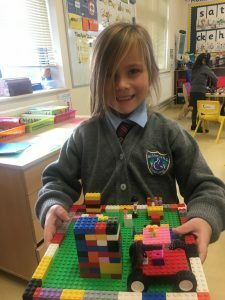 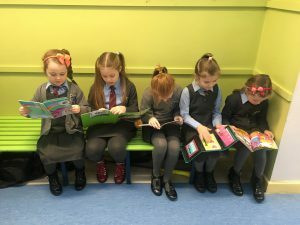 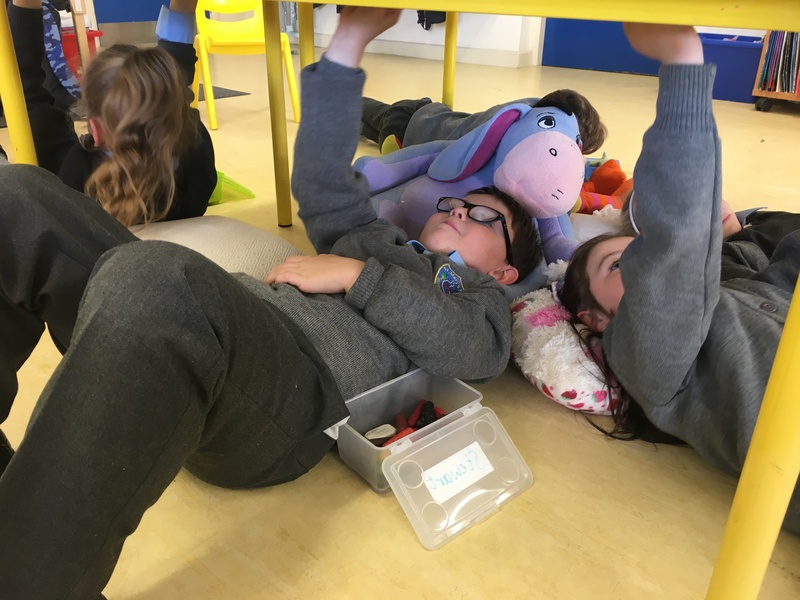 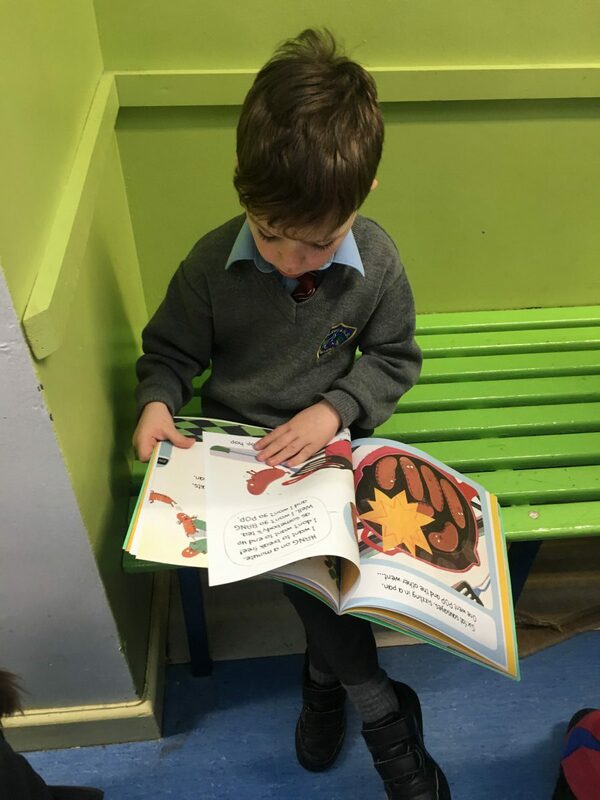 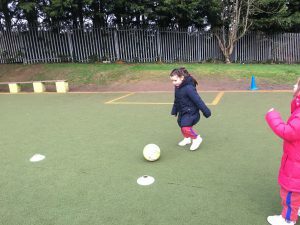 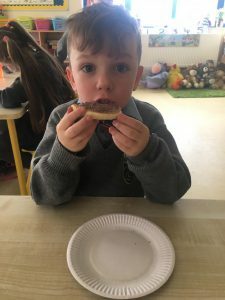 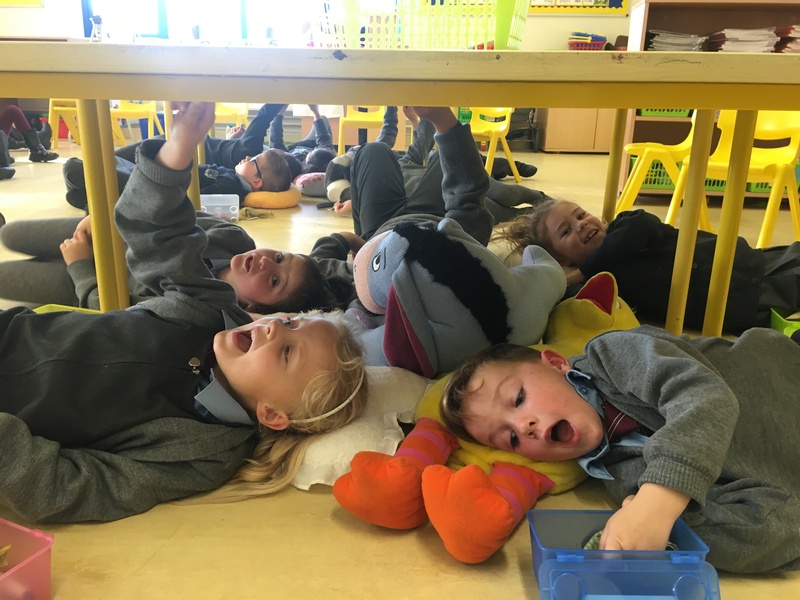 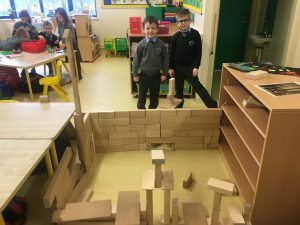 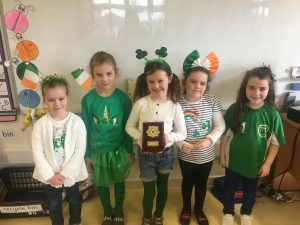 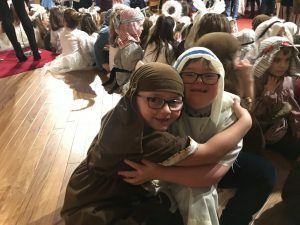 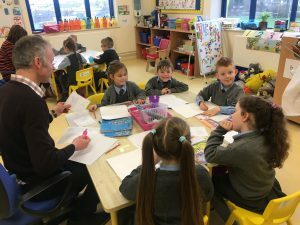 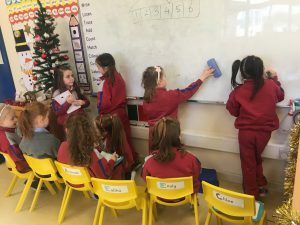 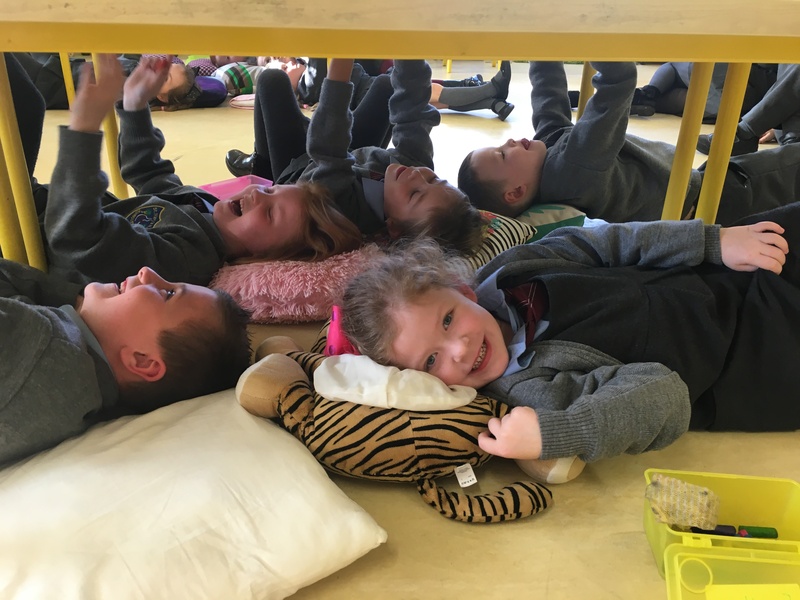 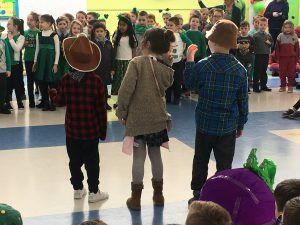 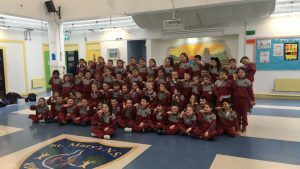 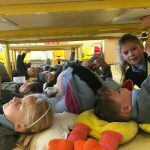 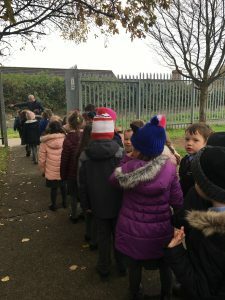 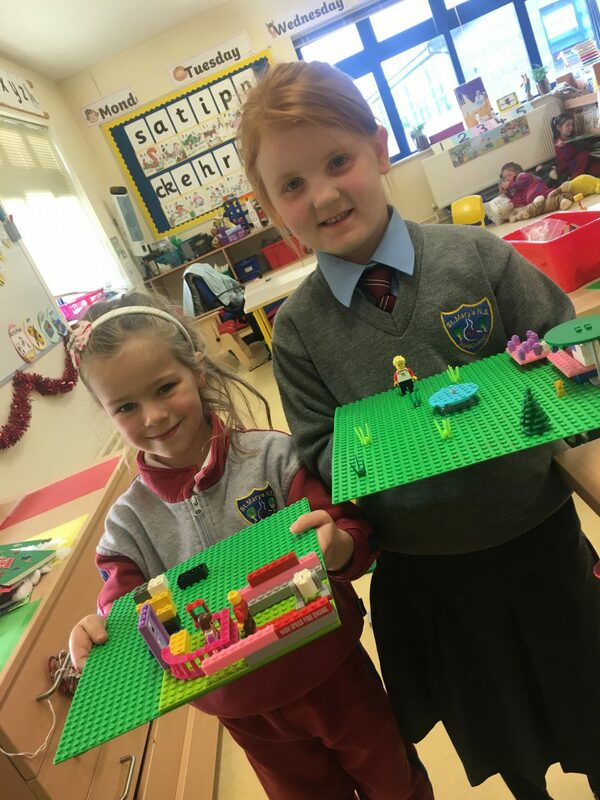 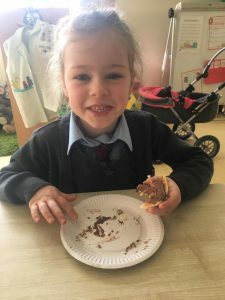 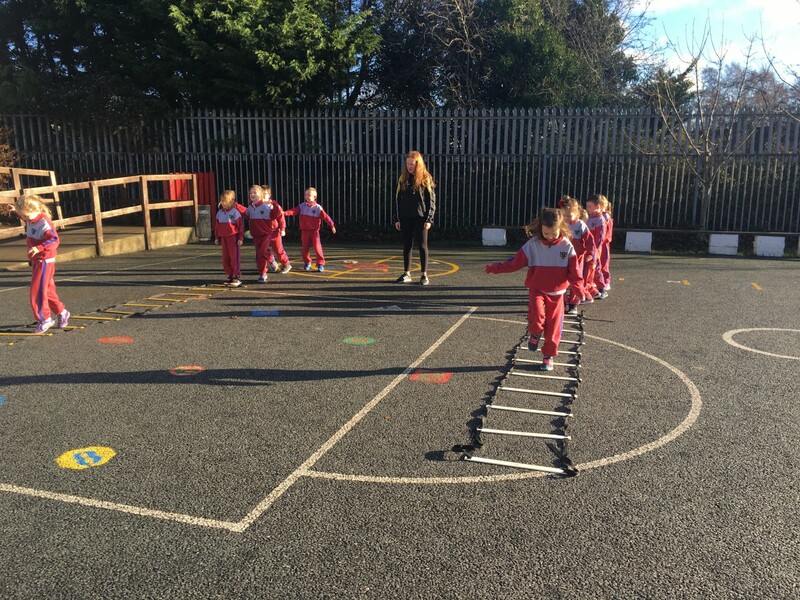 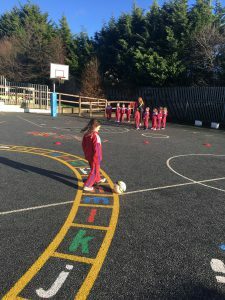 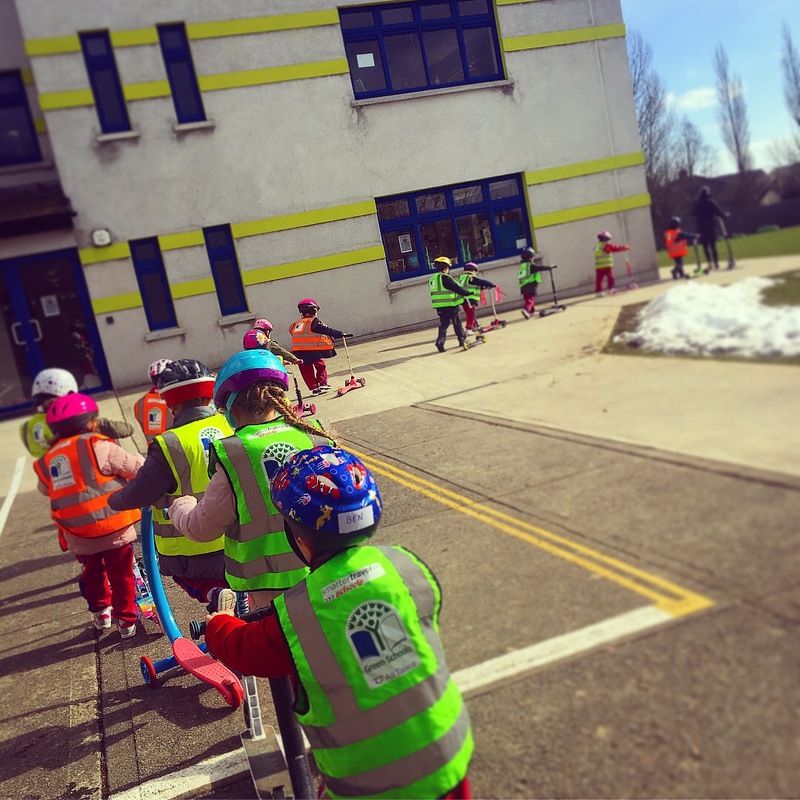 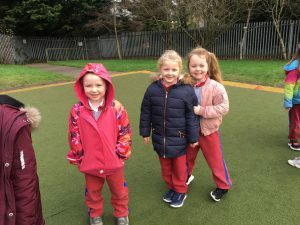 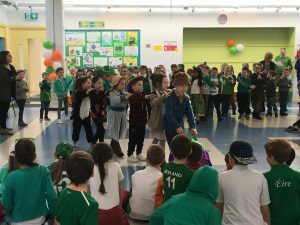 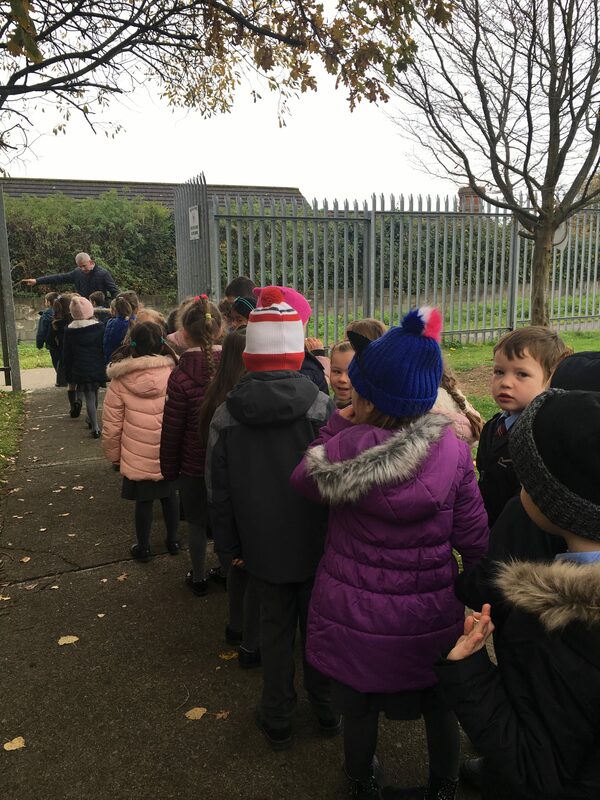 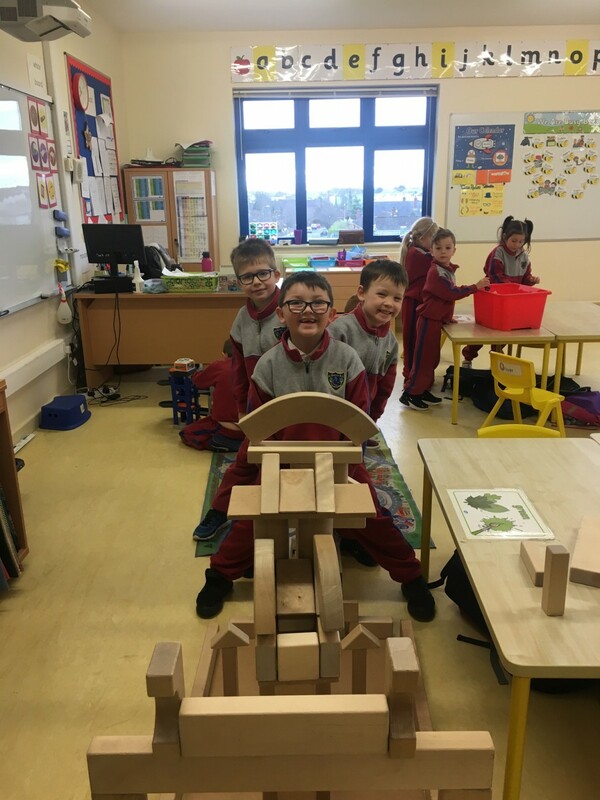 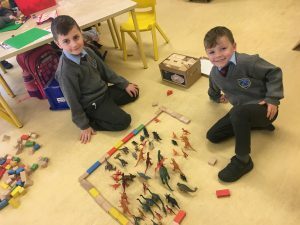 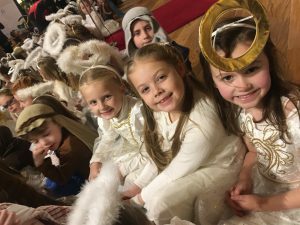 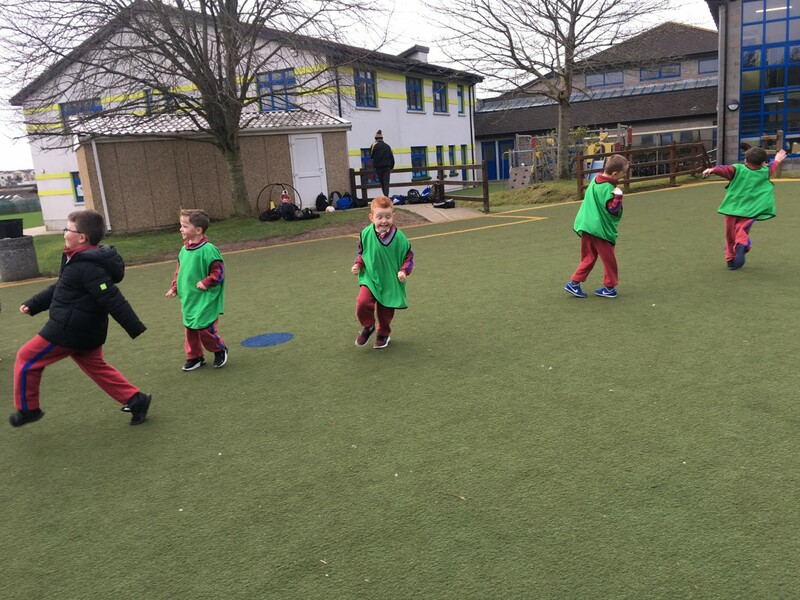 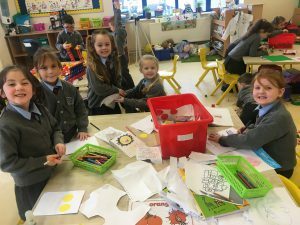 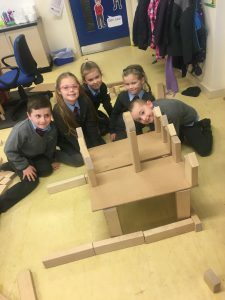 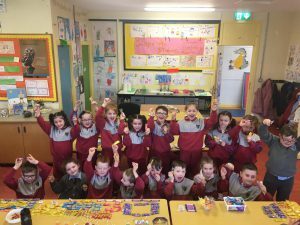 Welcome to Our Senior Infants Class Blog!!! 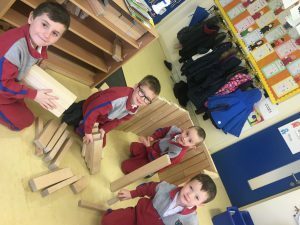 We have been very busy so far this year in Senior Infants and wanted to show everybody a taster of what happens up in Room 16!! 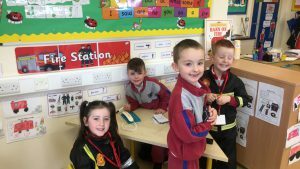 - Everyone can now start bringing their own pencil cases to school to use! 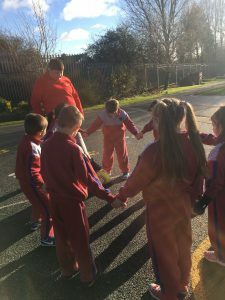 Over the past few months Sean has been teaching us some Lámh signs. 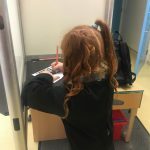 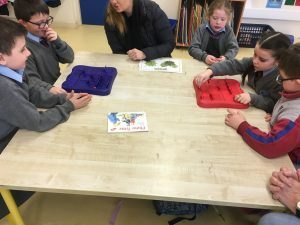 Lámh is a manual sign system used by children and adults in Ireland to help support communication. 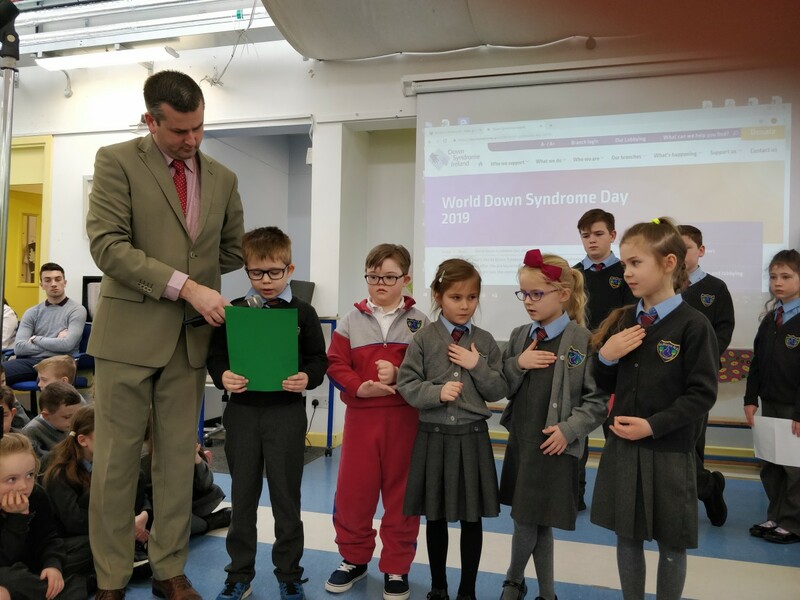 This week we decided to show the rest of the school what we have learnt and signed our good news of the week! 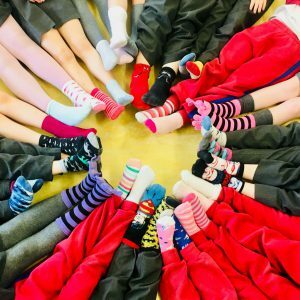 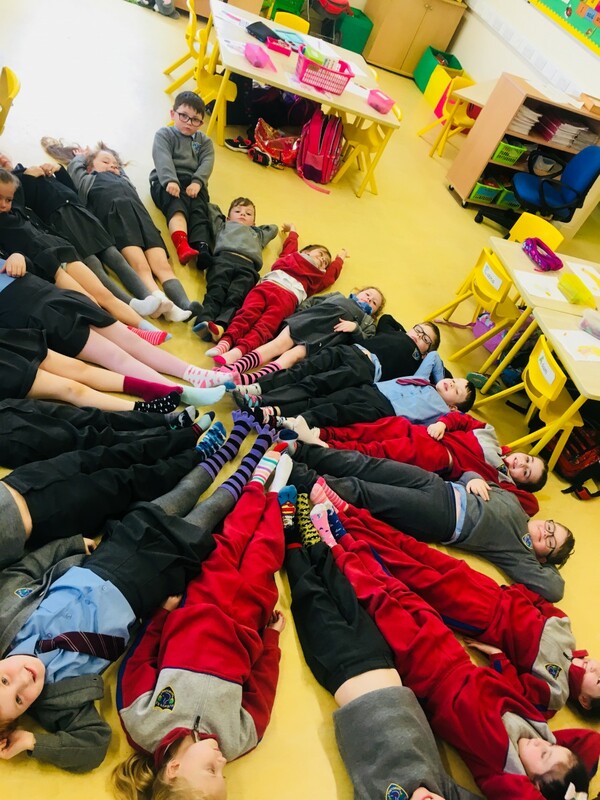 Today we all rocked our socks for World Down Syndrome Day and tomorrow for assembly we will be reading and signing our news to celebrate the day! 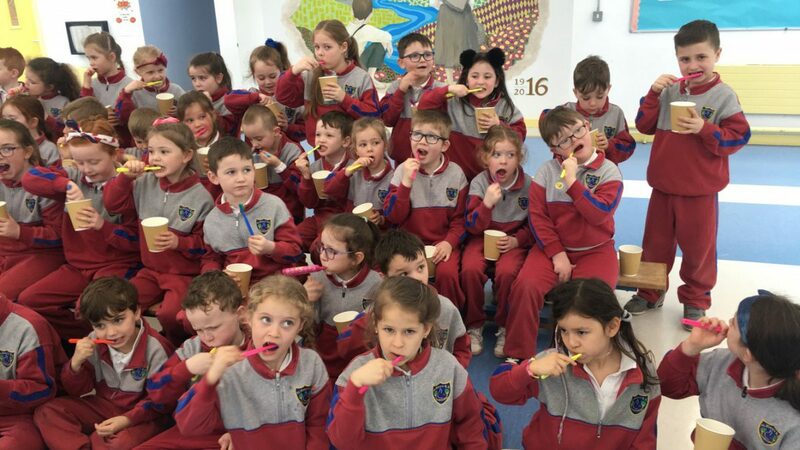 Today Senior Infants took part in a 2 minute brush-a-thon in aid of diabetes Ireland! 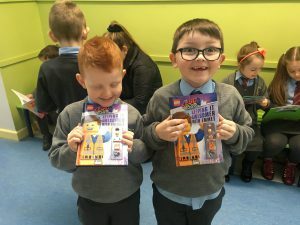 We had great fun, raised a lot of money and got lovely goodie bags!! 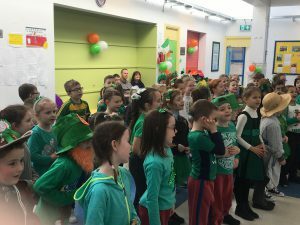 Bhí spraoi agus craic againn sa halla inniu le Mr. O’Byrne agus na páistí go lear! Bhíomar ag canadh agus ag damhsa! 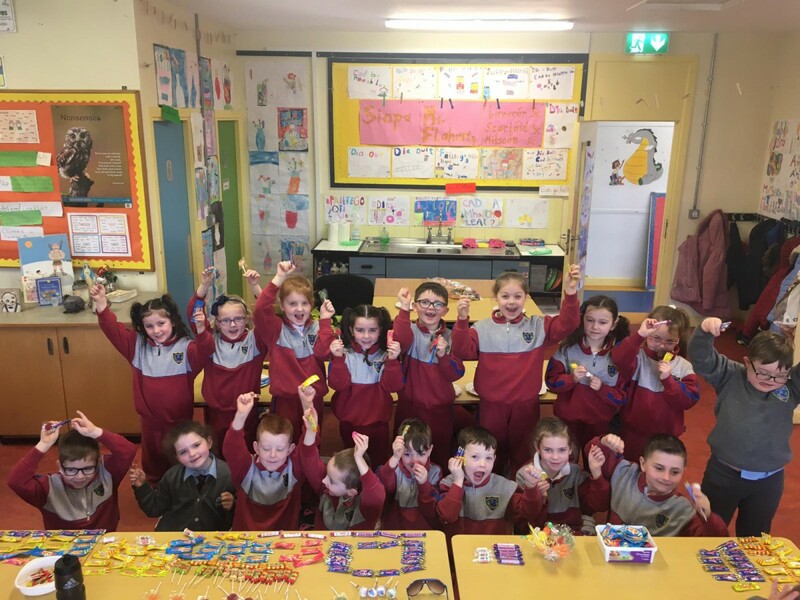 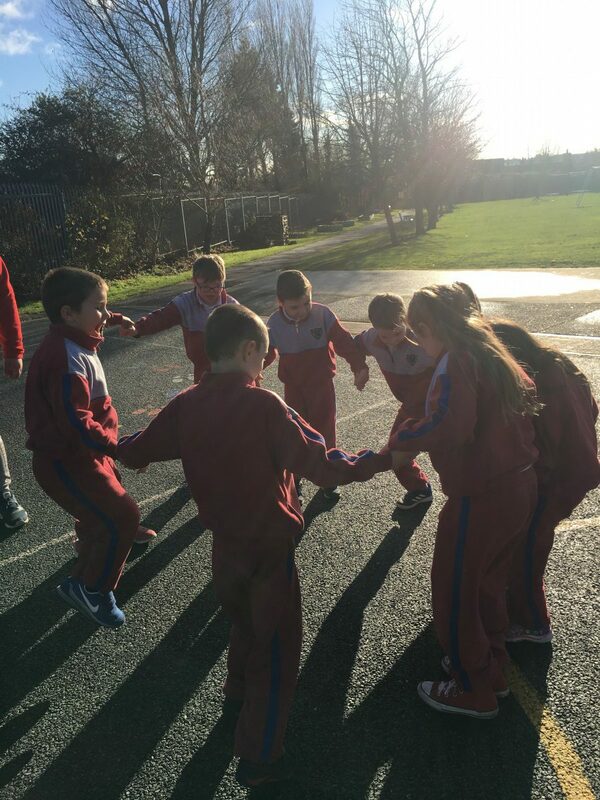 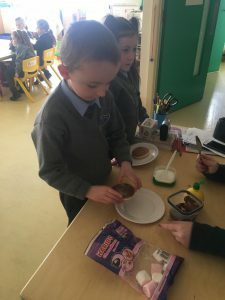 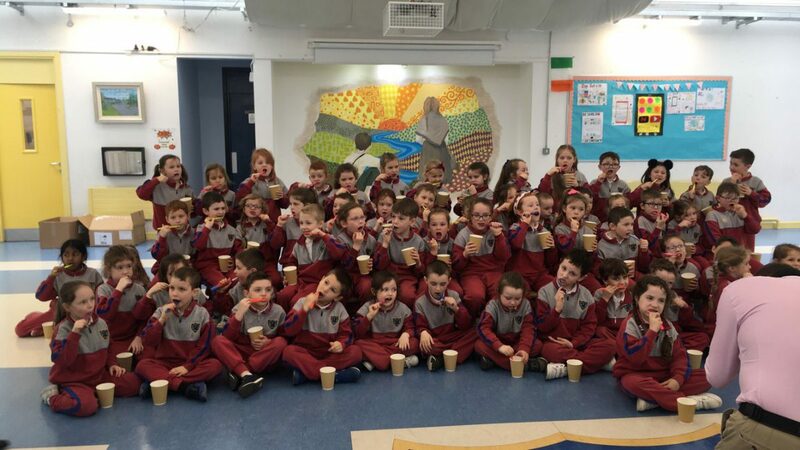 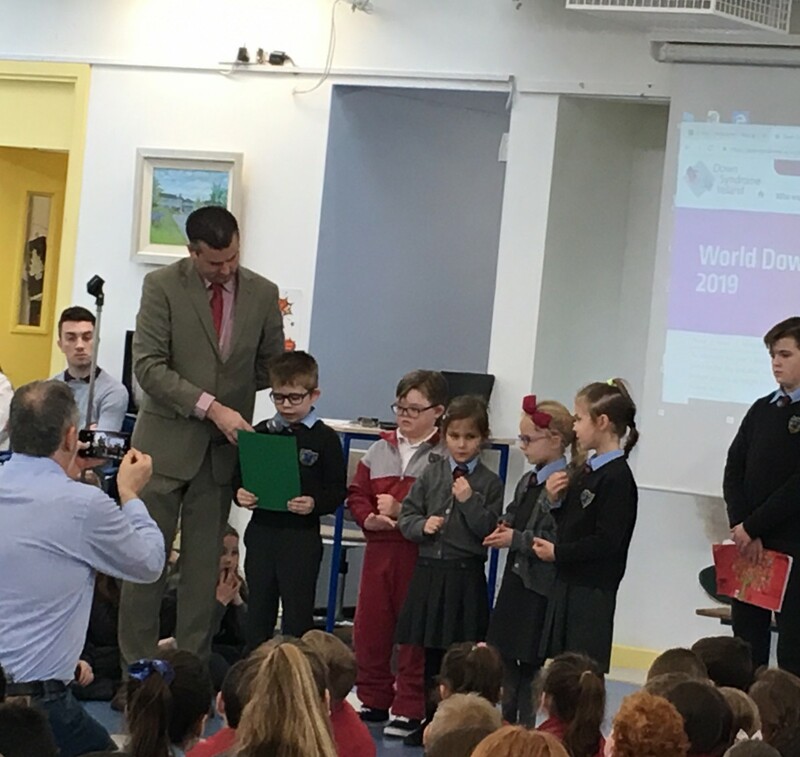 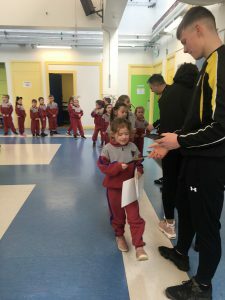 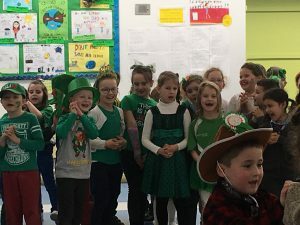 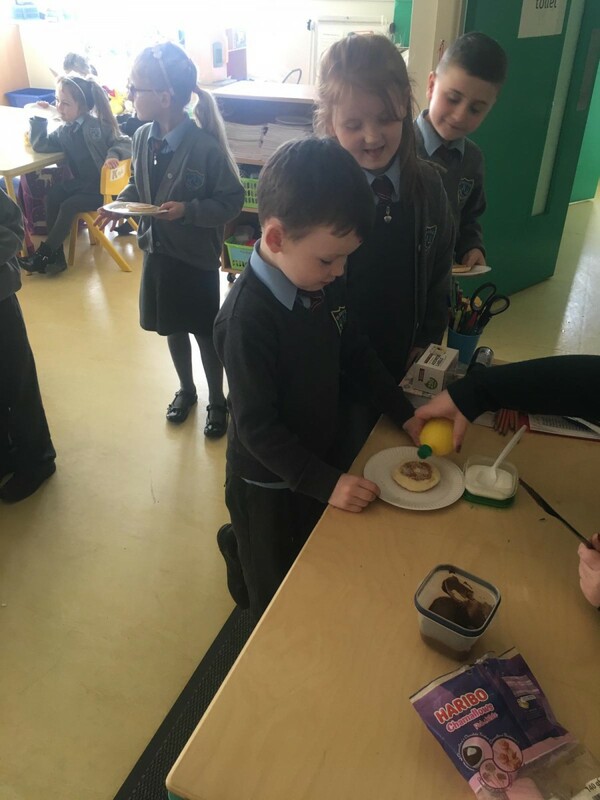 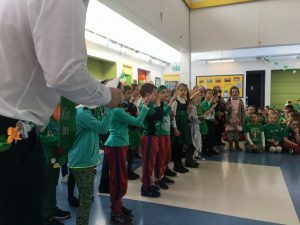 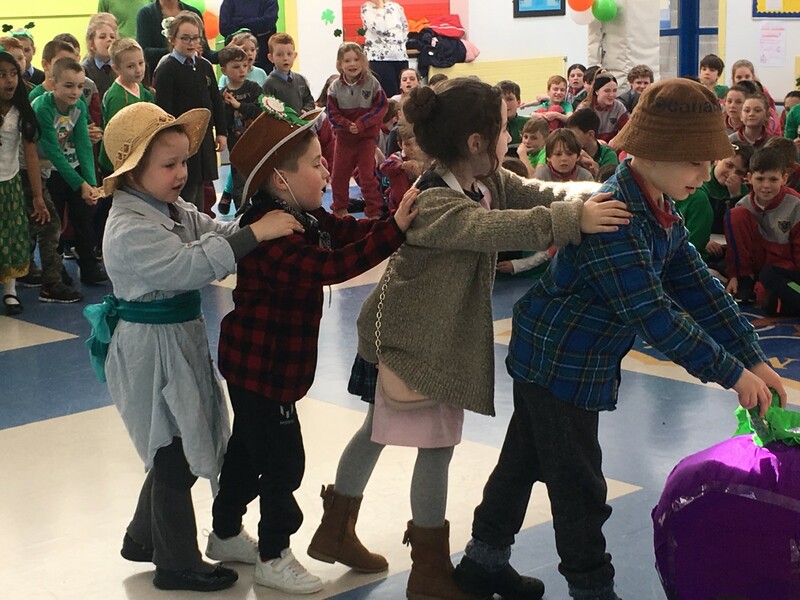 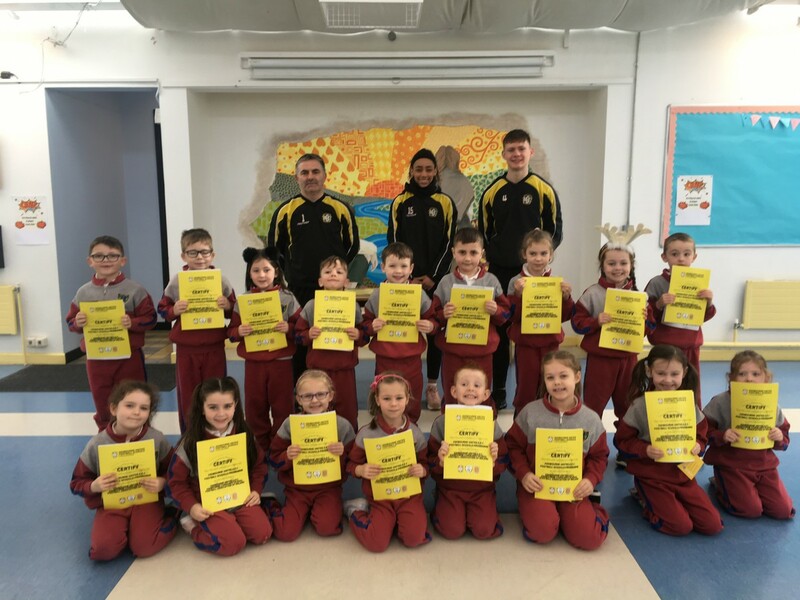 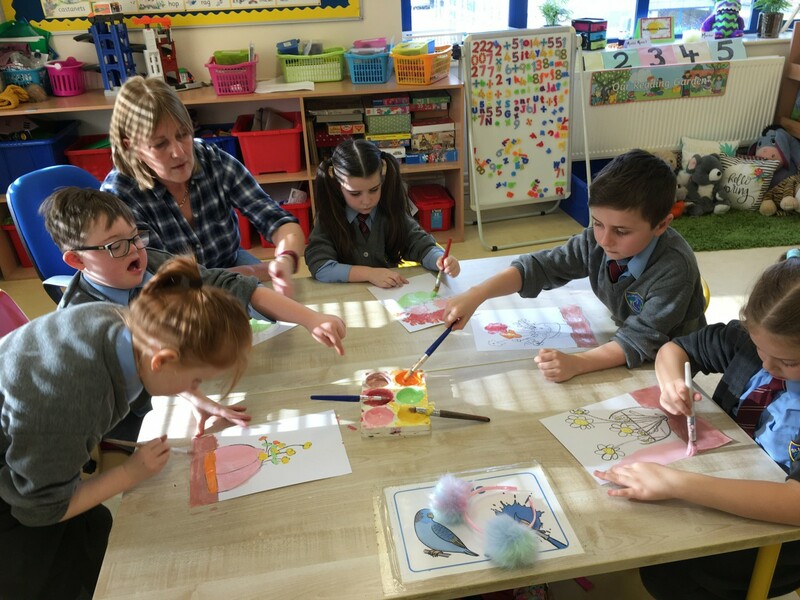 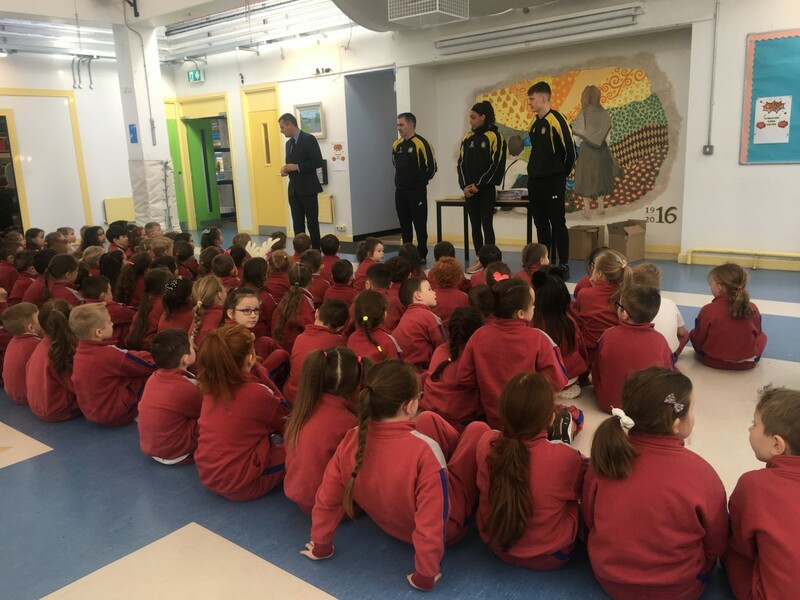 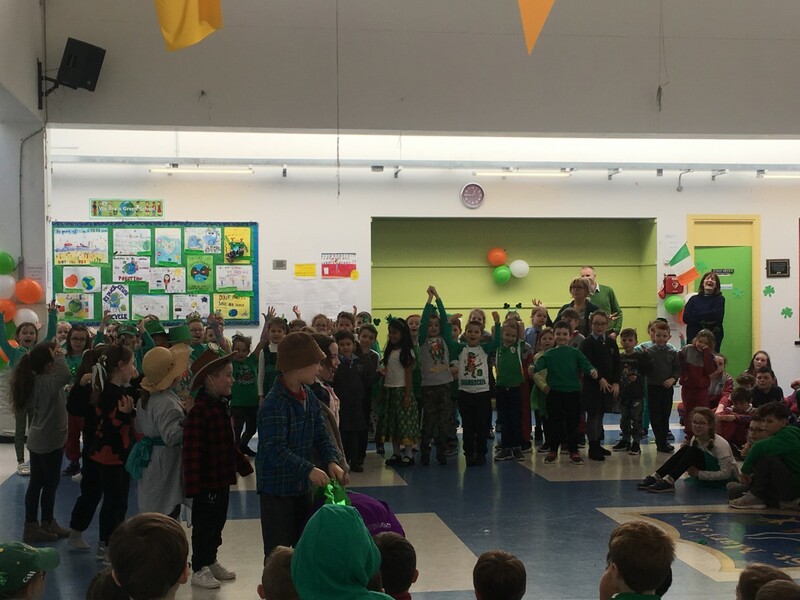 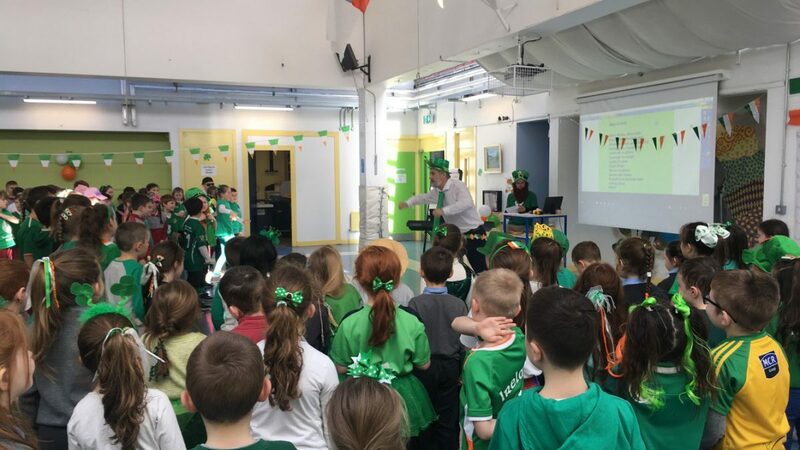 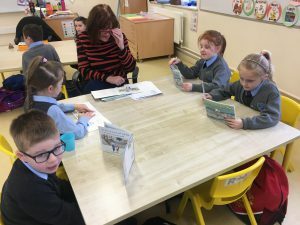 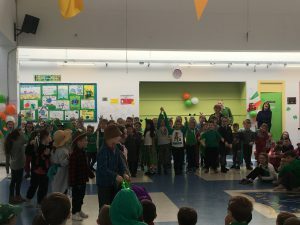 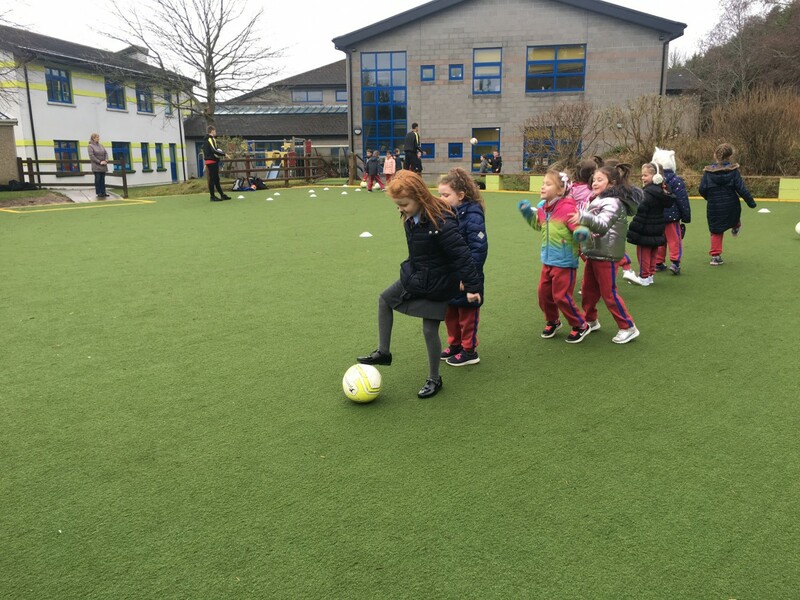 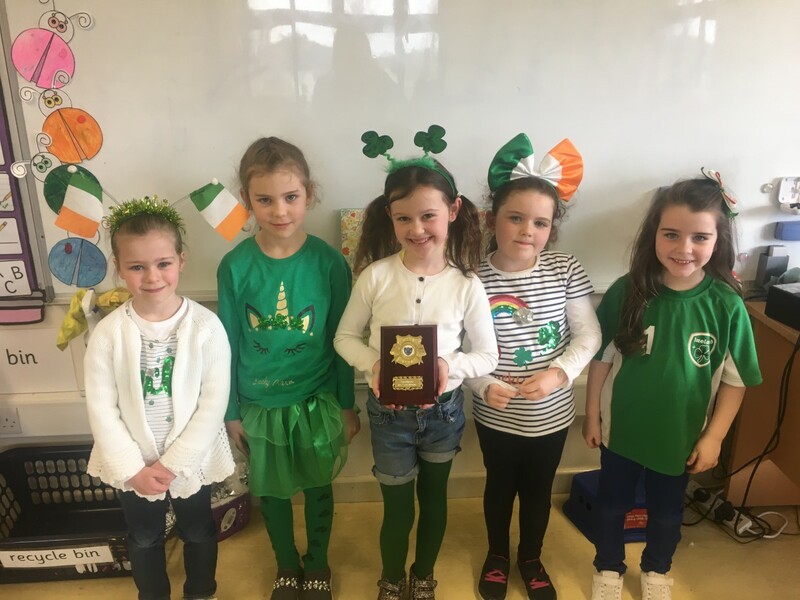 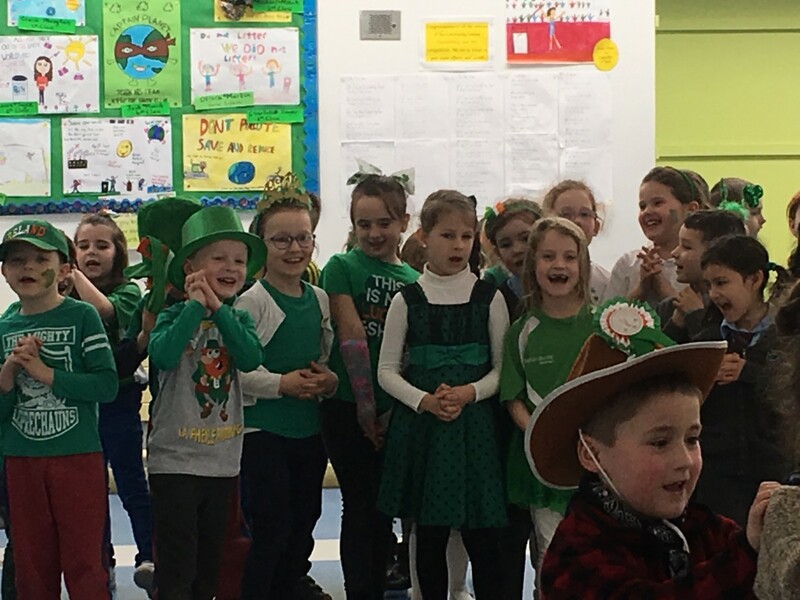 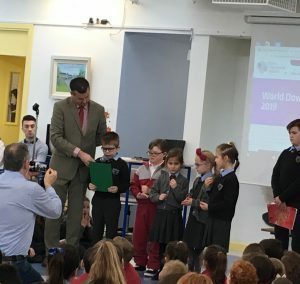 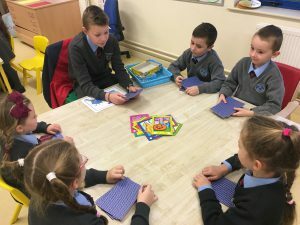 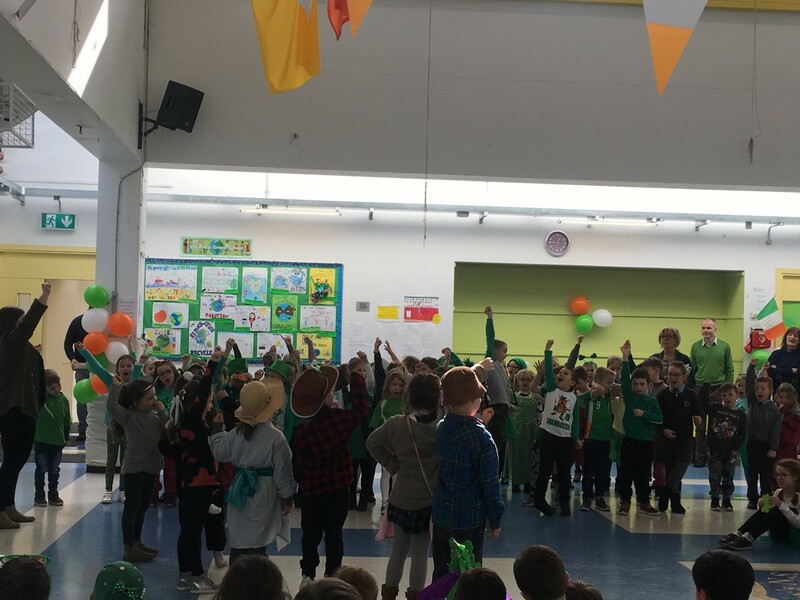 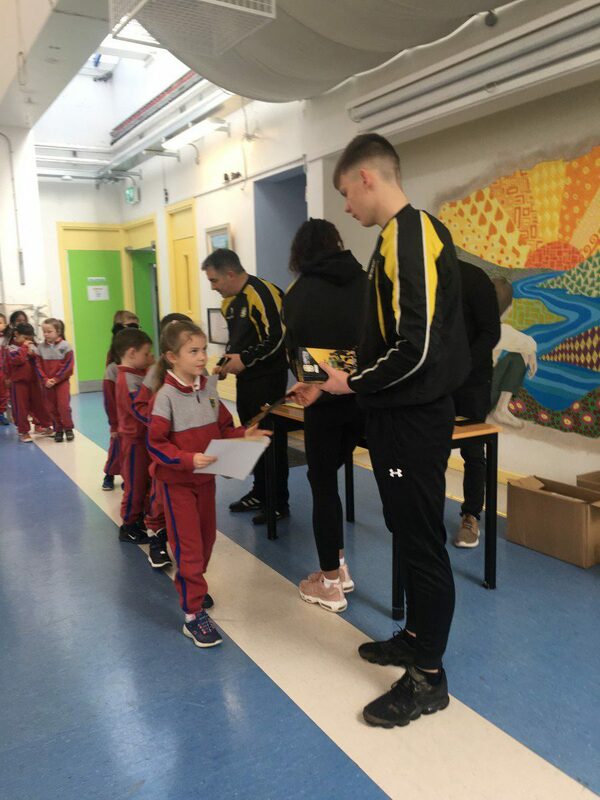 As part of Seachtain na Gaeilge this year Ms. Flaherty’s class set up a siopa milseáin and we were delighted to attend! 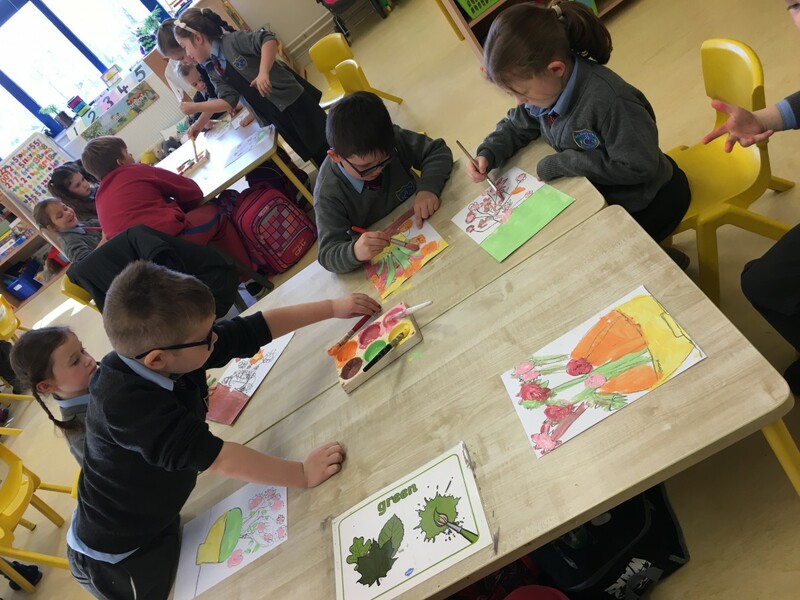 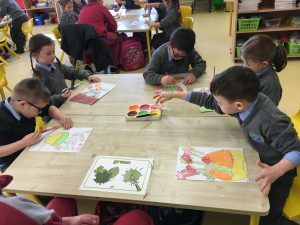 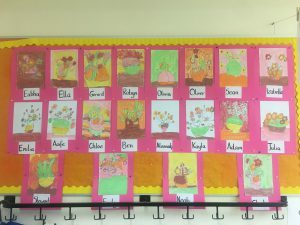 Have a look at our beautiful flower paintings and St. Patrick’s Day crafts! 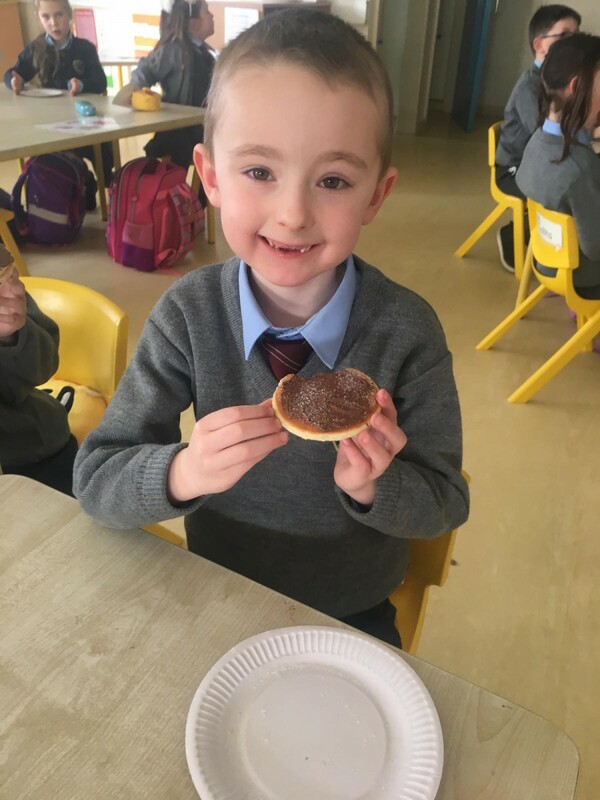 Happy Pancake Tuesday! 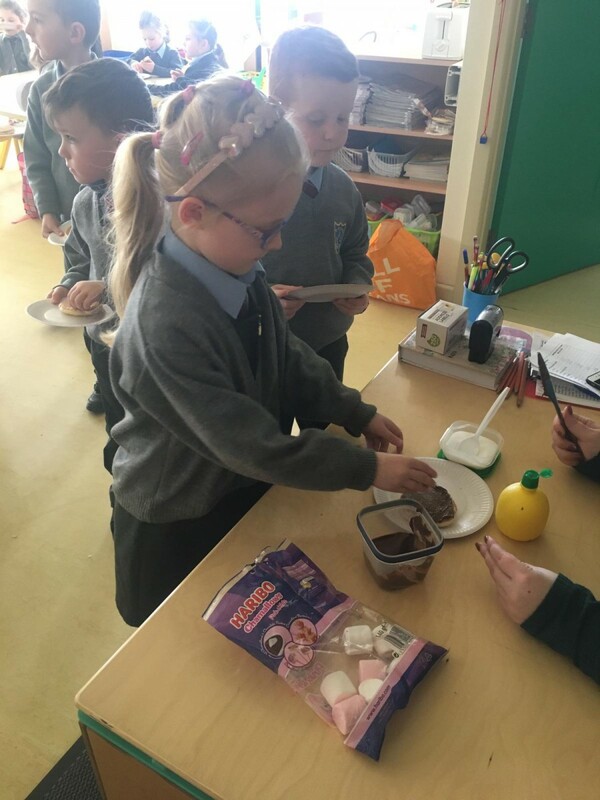 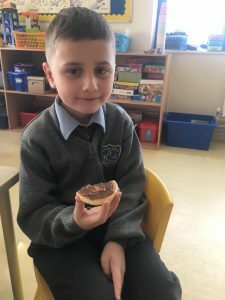 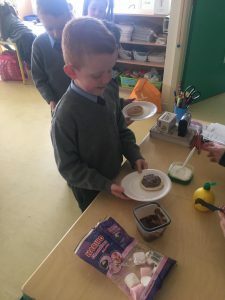 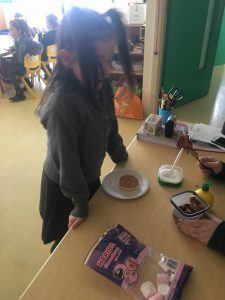 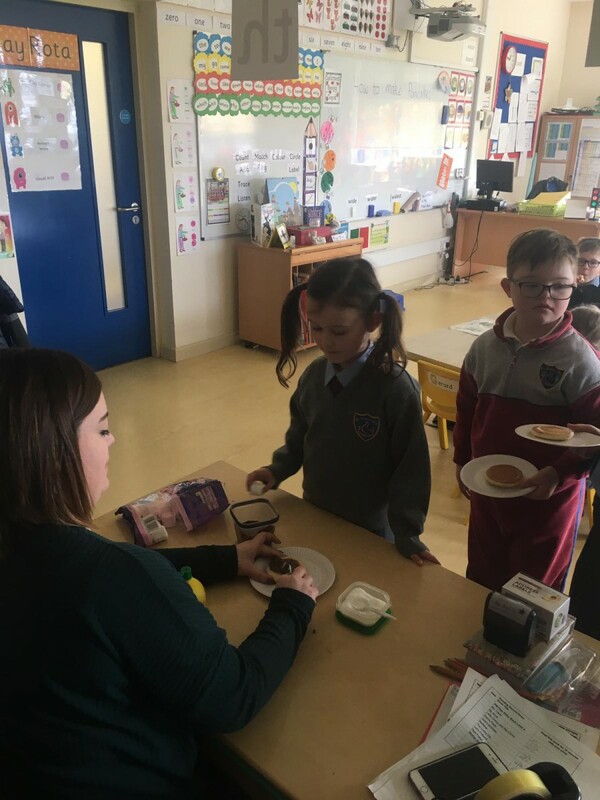 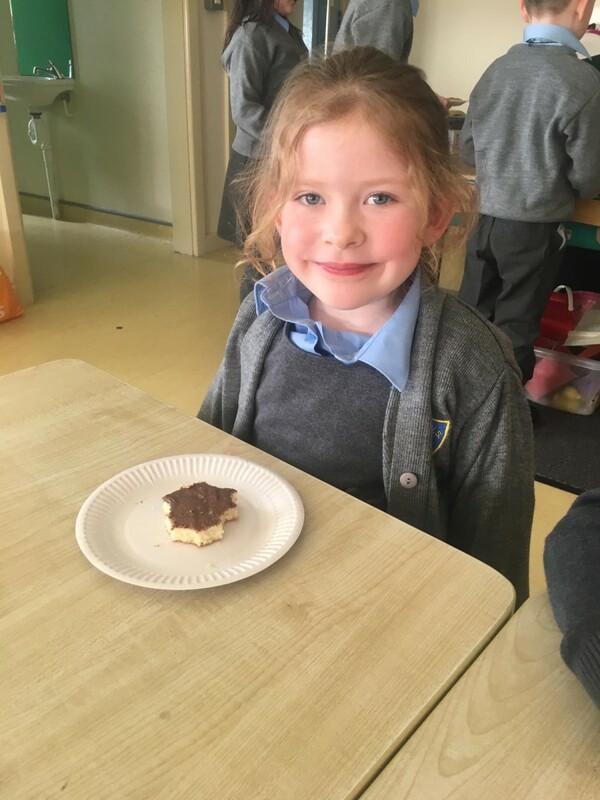 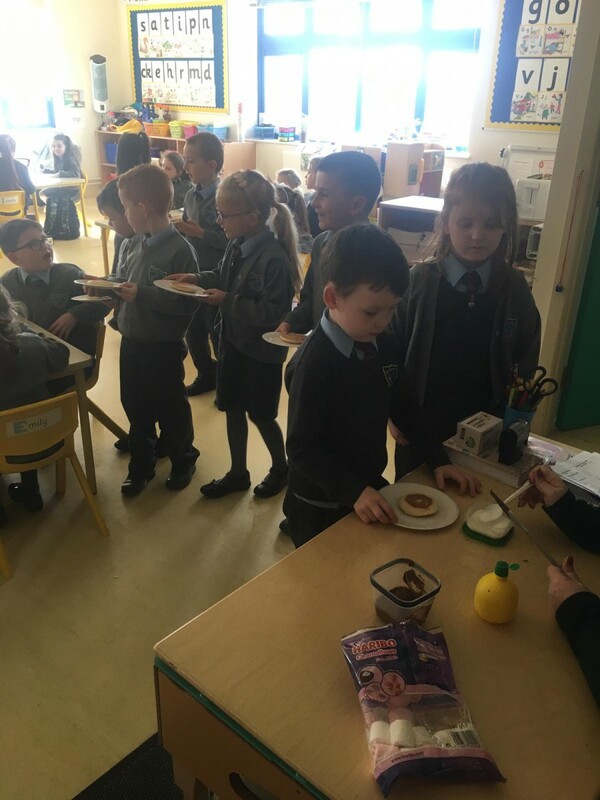 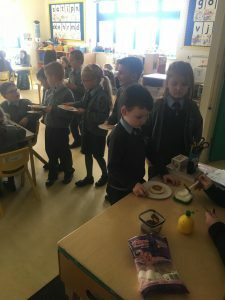 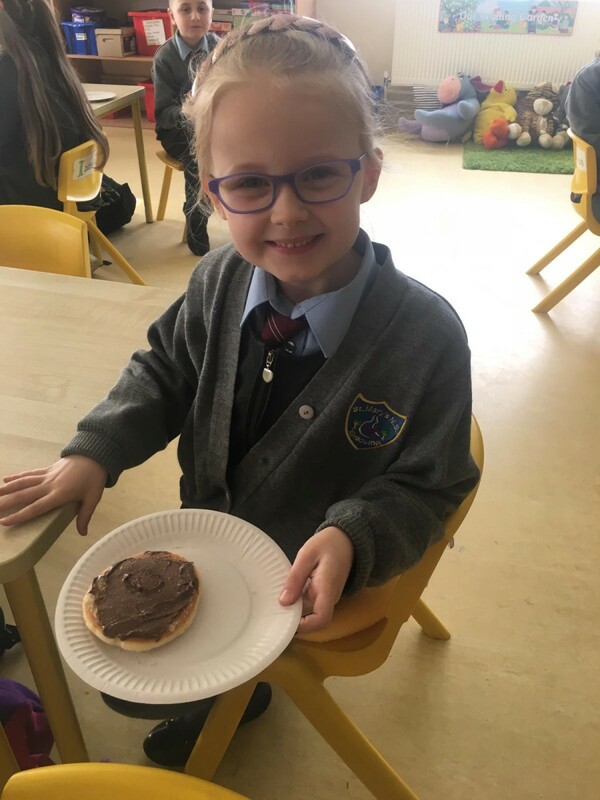 We enjoyed some tasty pancóga with siúcra, seacláid agus líomóid thanks to Ms. Moriarty! Today we got our certificates for completing the FAI soccer training! 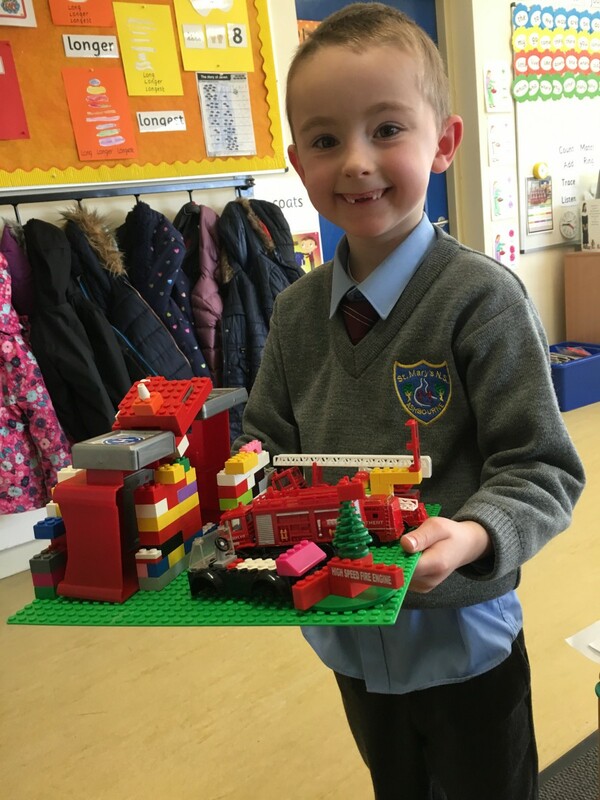 This weeks theme is the fire station. 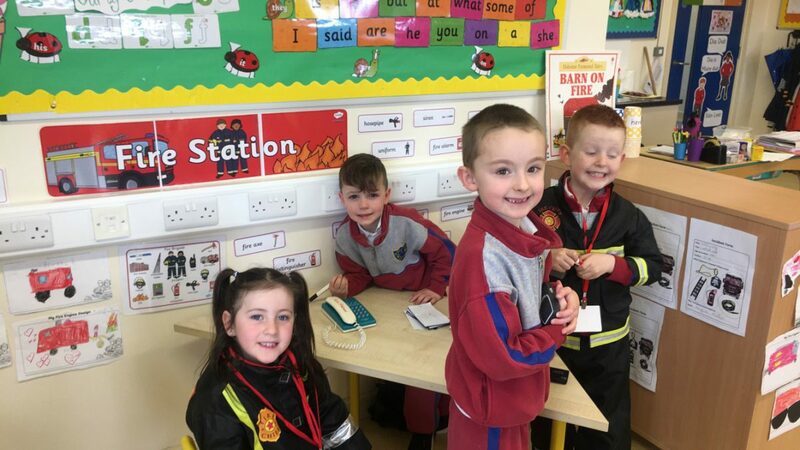 Ms. Moriarty has been teaching us all about fire stations and fire safety! 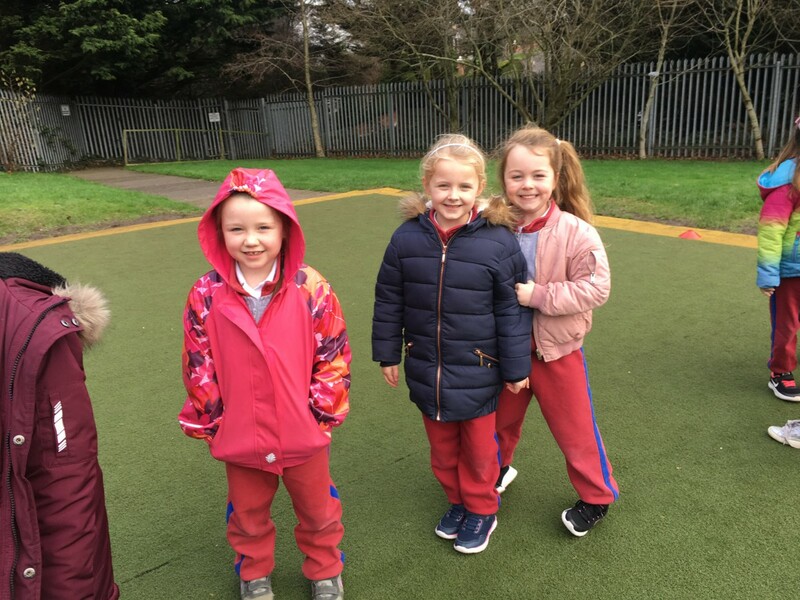 Happy Valentines Day everyone! 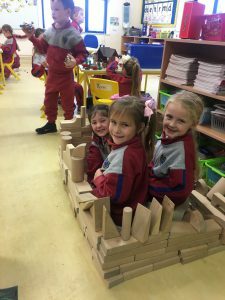 Take a look at the love bugs we made. 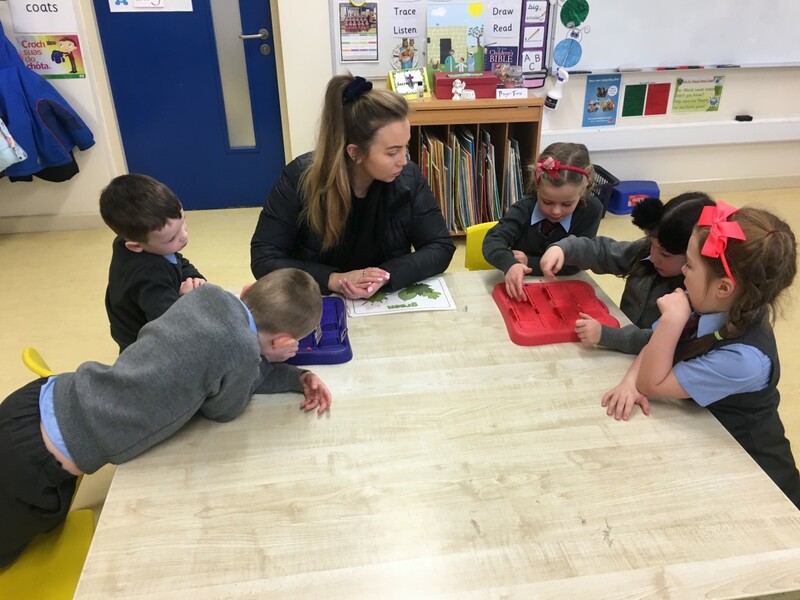 We are delighted to have Ms. Moriarty teaching us for the next few weeks. She has set up a lovely Garda Station in our home corner for us to play with. 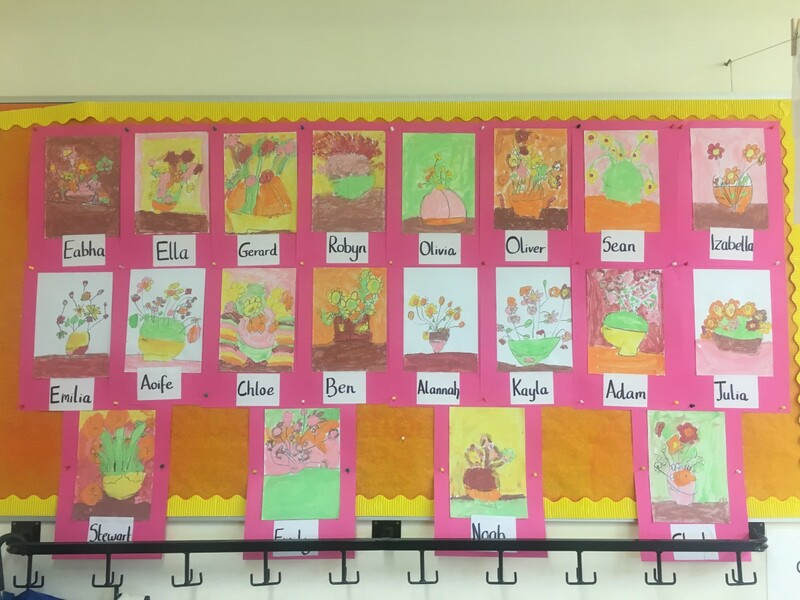 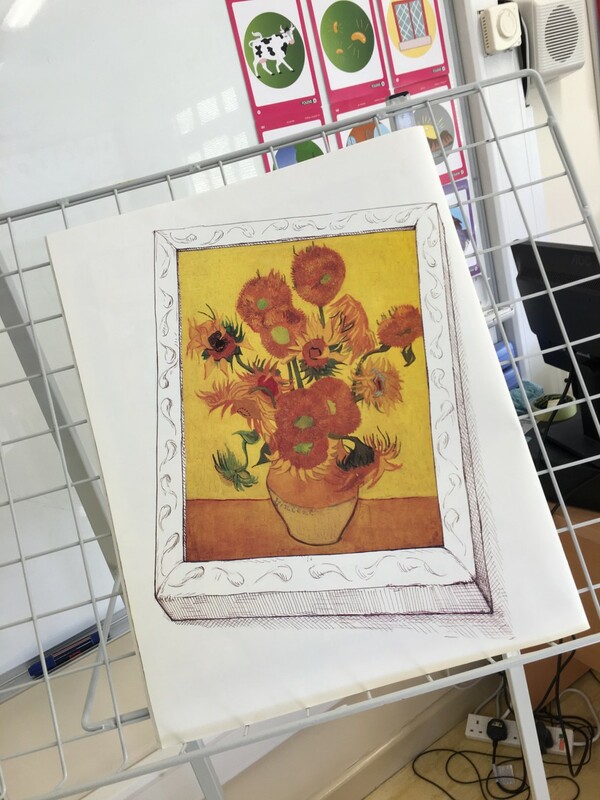 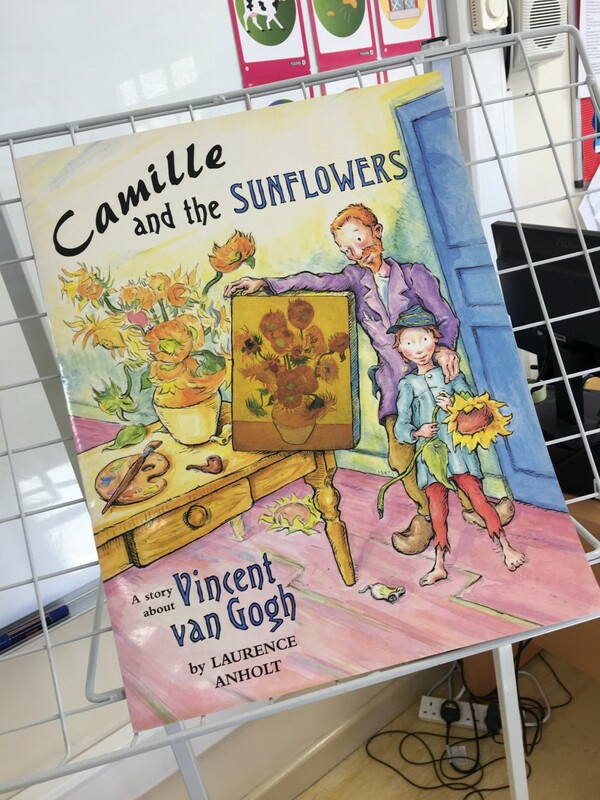 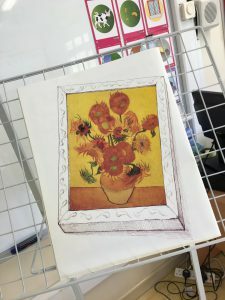 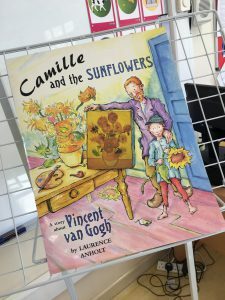 For our recent art lesson we were inspired by the wonderful artist Vincent Van Gogh and the lovely story “Camille and the Sunflowers”. Thanks to sixth class for helping us with our masterpieces. Have a peak at our work in progress! We love the book fair!!! 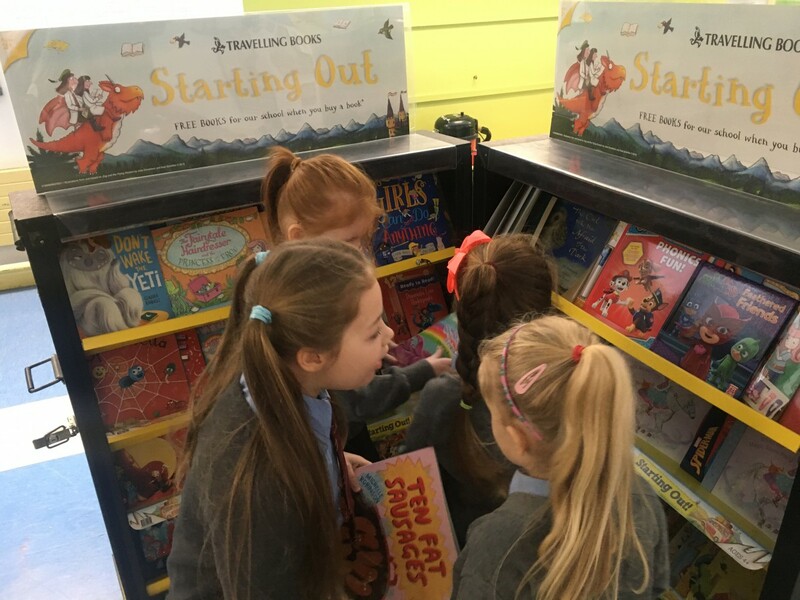 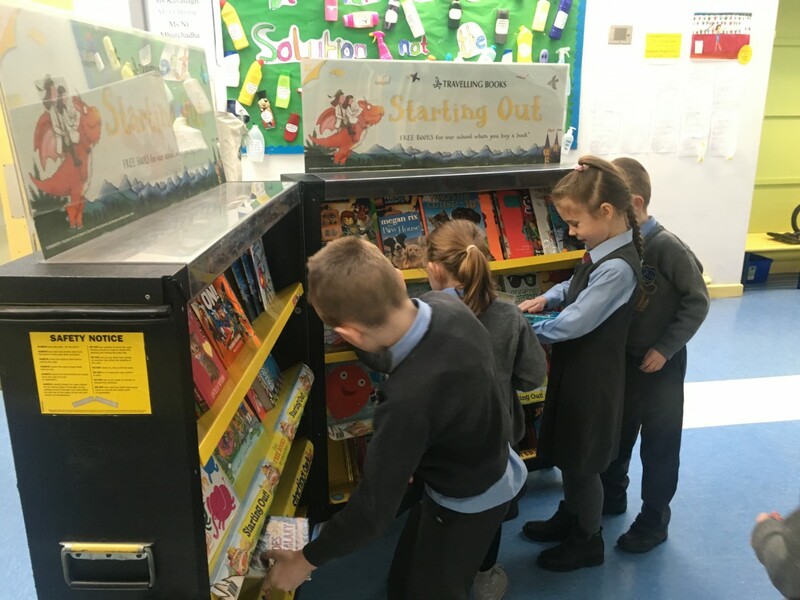 Every day we get the opportunity to go down to the book fair, read loads of lovely stories and even buy some books! 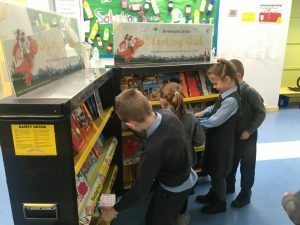 We are in the middle of our Literacy Lift-Off stations. 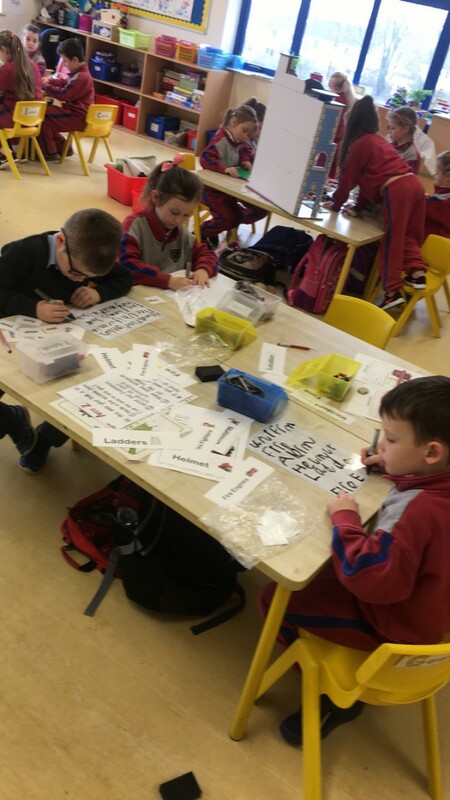 Every day from Monday to Thursday Mr. Dunne and Ms. Moylan come to visit our classroom and we do a variety of different reading, writing and oral language stations. 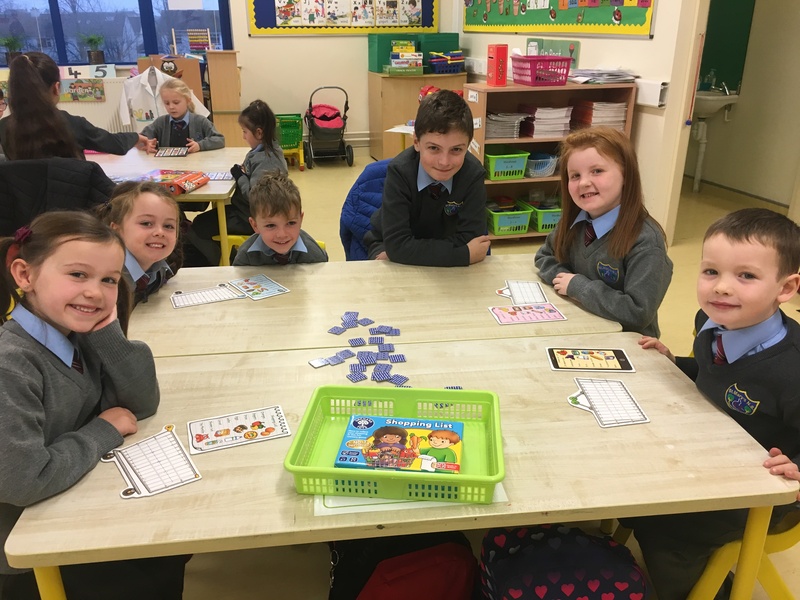 We are loving getting new books every day, playing games together and showing off how good we are at out reading and writing! 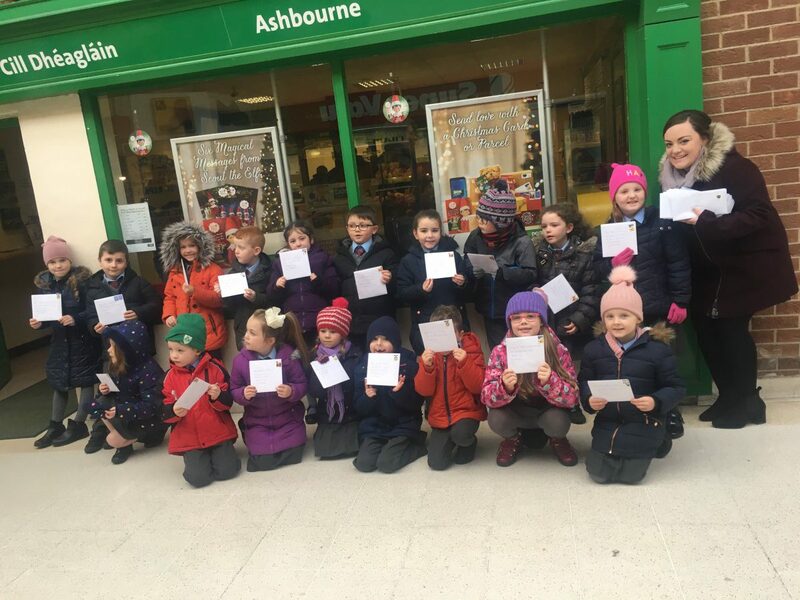 After our very successful trip to the post office before Christmas, Ms. Moroney’s class asked would we help them to post their letters to their grandparents! 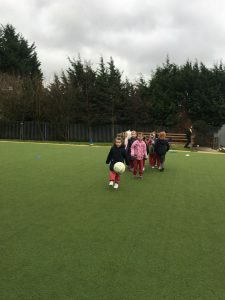 We have finished our sessions of soccer training. We have loved learning some new skills. 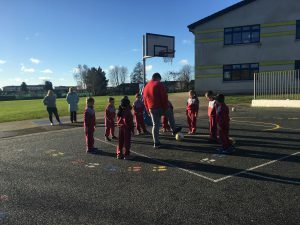 Thanks to all the transition years and trainers! 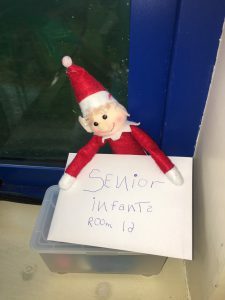 Sparkles left our class to go home to the North Pole today. 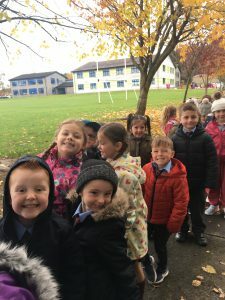 We are sad to see him go but he left us all a little present before he went! We had a lovely time at the carol concert last night and we hope everyone enjoyed our singing! Take a look at what we got up to during free play today! We had lots of fun building fantastic creations, relaxing in our reading garden and playing teachers! 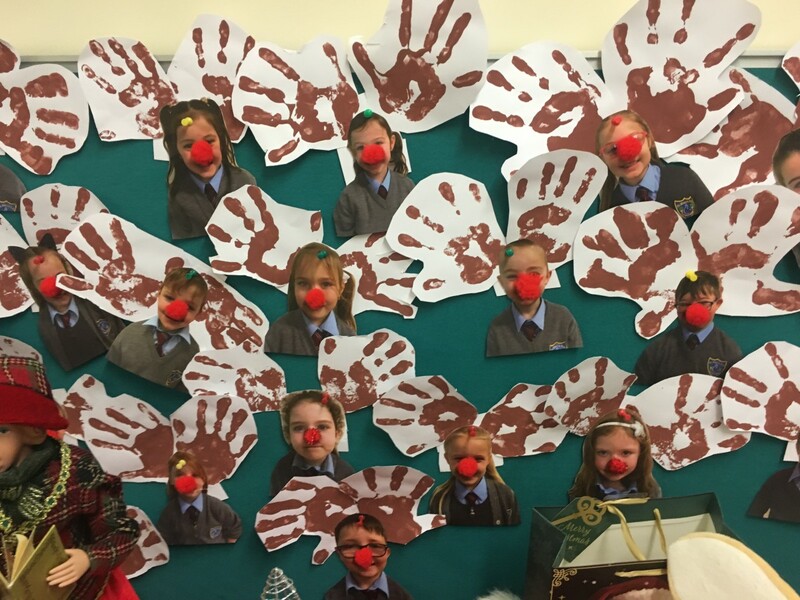 Have a look at our lovely stockings hanging on our very own fireplace and at our army of mini reindeer! 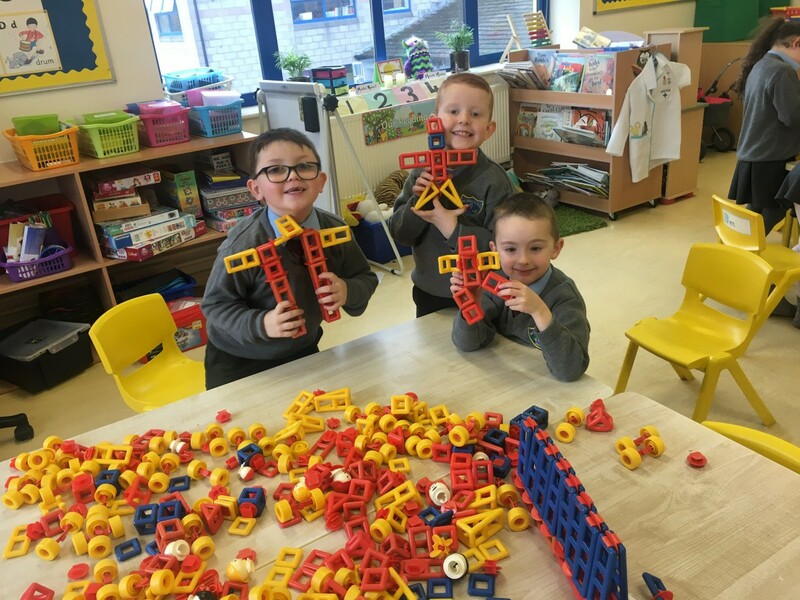 Some of the creations we have made during playtime this week!! 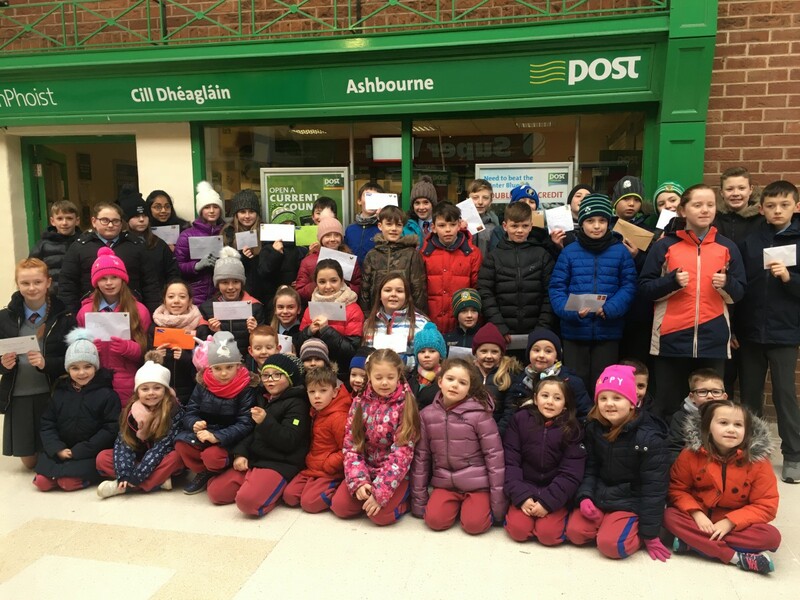 We’ve been having so much fun with our post office theme that we decided to take a trip to the post office today! 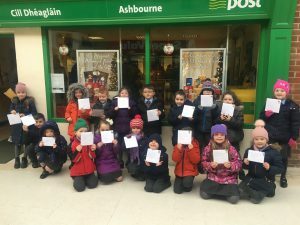 We even made our own Christmas cards to post! Christmas has arrived in room 16 and our elf Sparkles is back again to visit this year!! 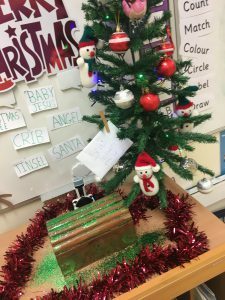 (We will have to teach Sparkles how to write his letters properly before he heads back to the North Pole!) 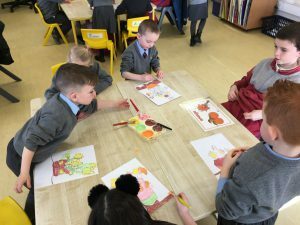 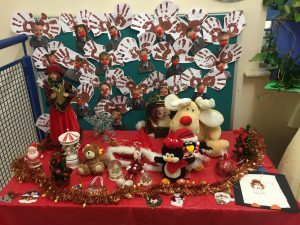 We have also started our Christmas table with all of the Senior Infants! 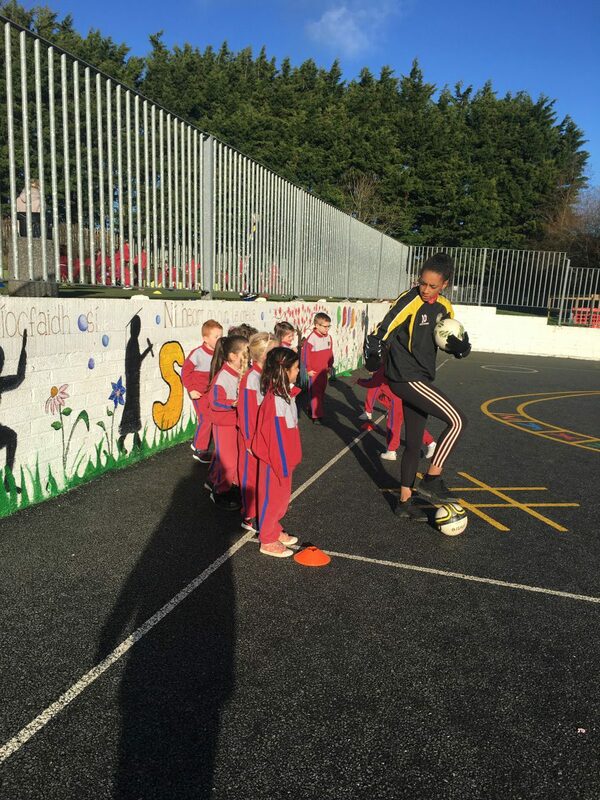 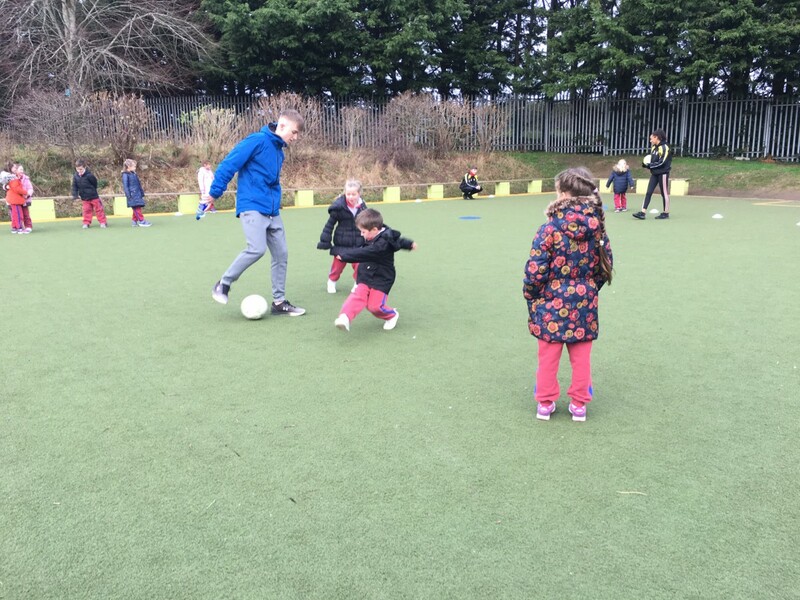 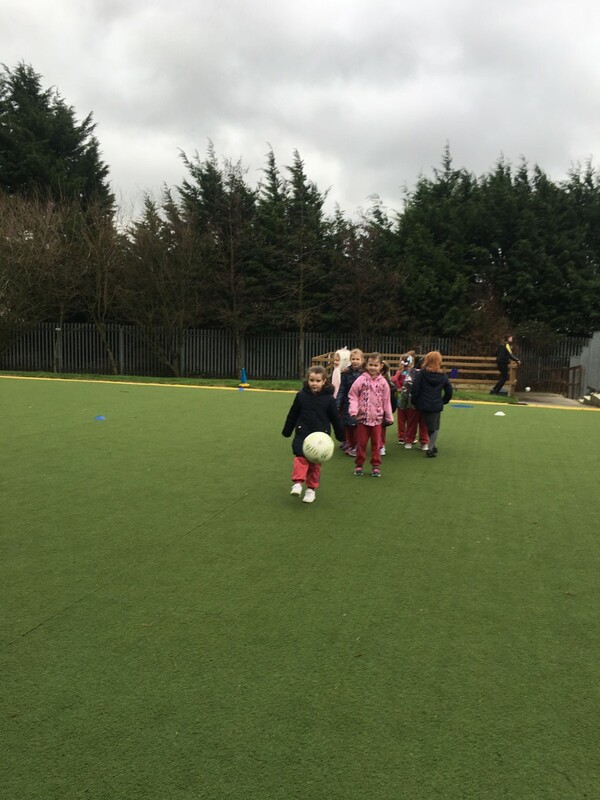 Today we started soccer skills with some local TYs!! 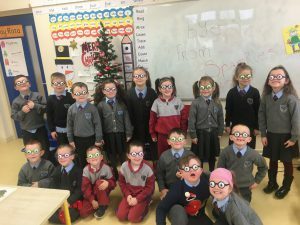 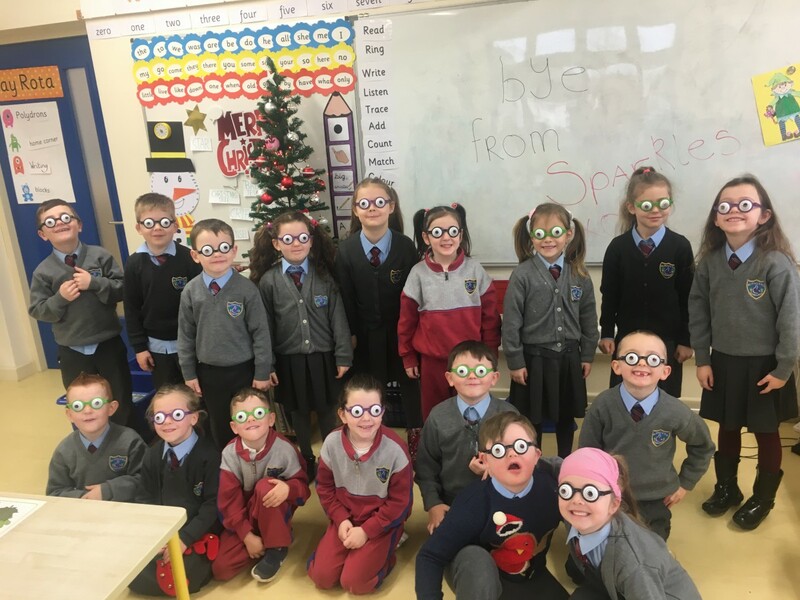 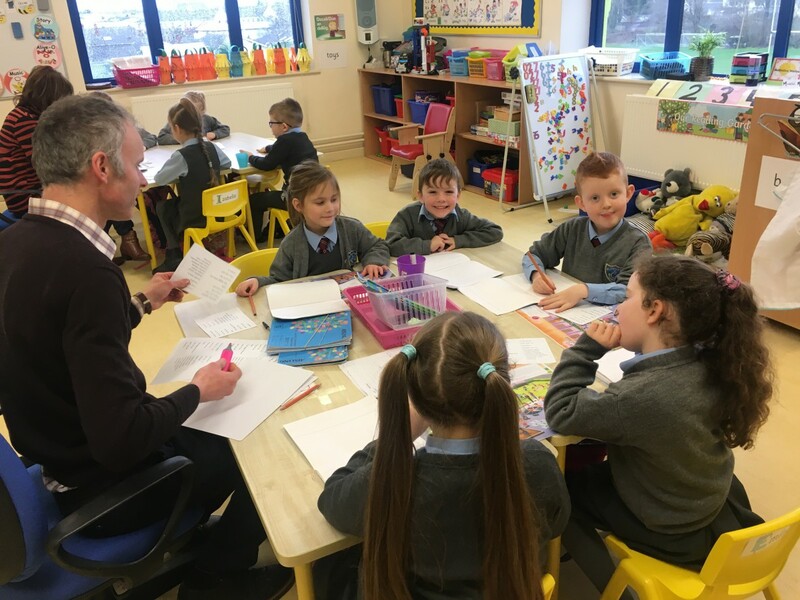 We also had a visit from Mr. O’ Bradaigh’s class. 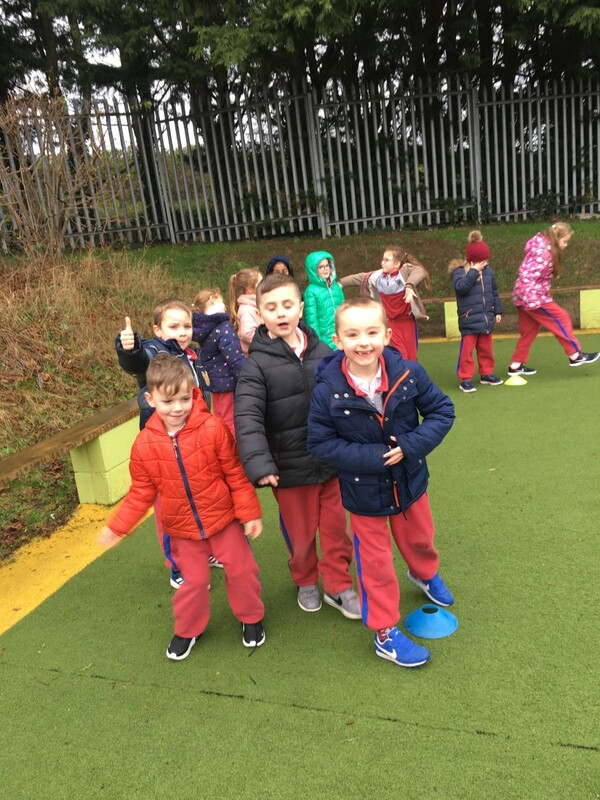 What a great Monday! We are all ready for December to begin this Saturday with our Christmas Countdown snowmen!! 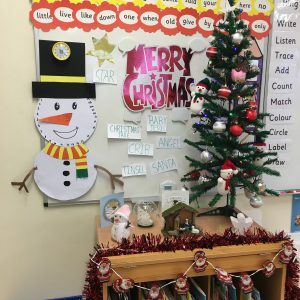 We also have Frosty the Snowman for our classroom Countdown! 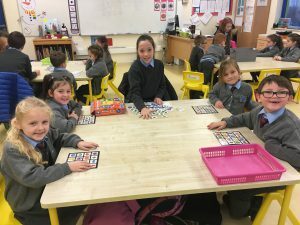 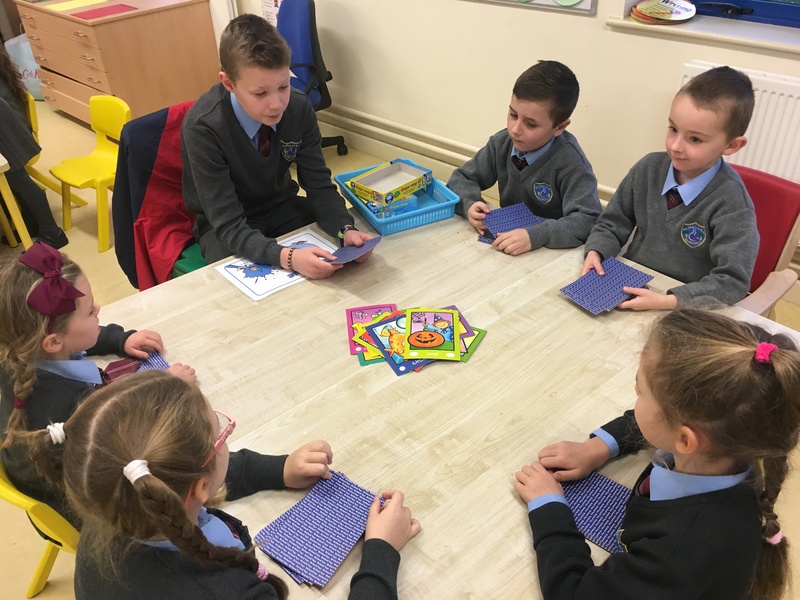 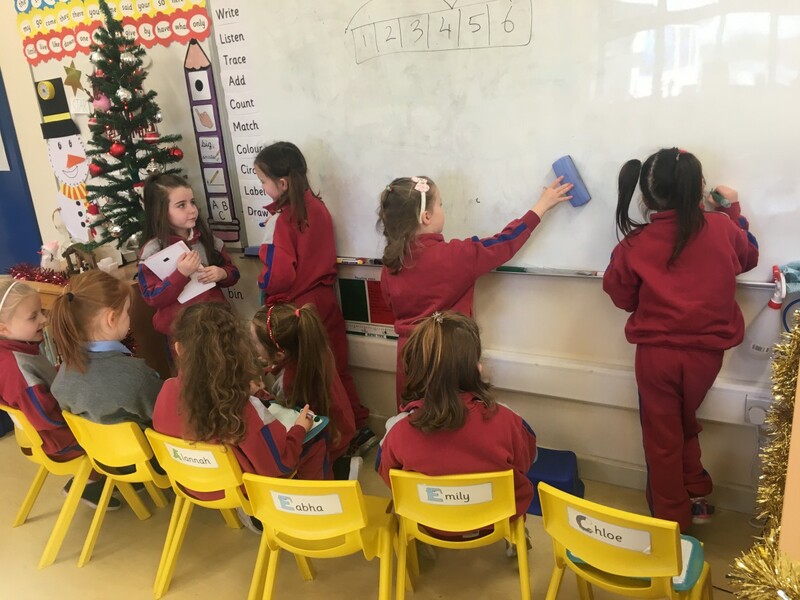 Today we had some fifth class pupils who helped us with our maths stations. 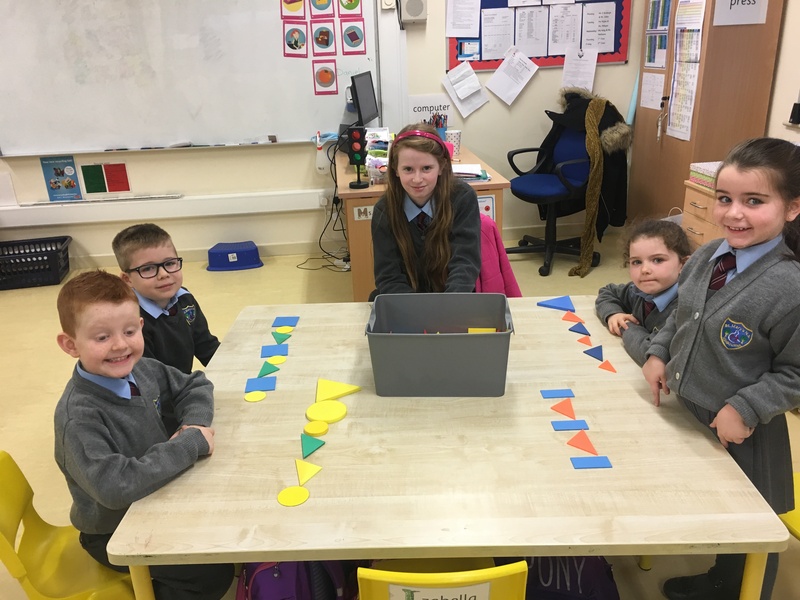 We had great fun playing 2D shape games, making patterns and playing board games! Have a look  at some of this weeks creations!! 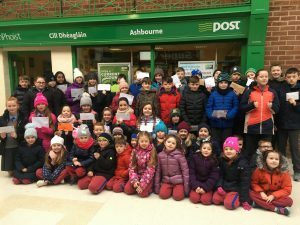 We’re having great fun this week with our post office theme. 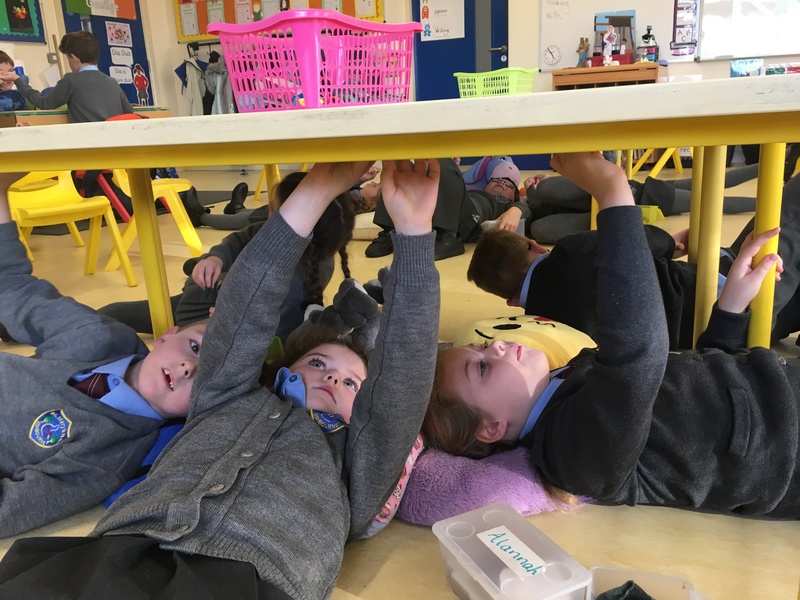 Today’s art lesson was inspired by Michelangelo and his wonderful Sistine Chapel paintings. 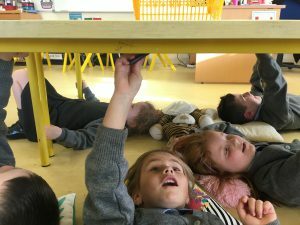 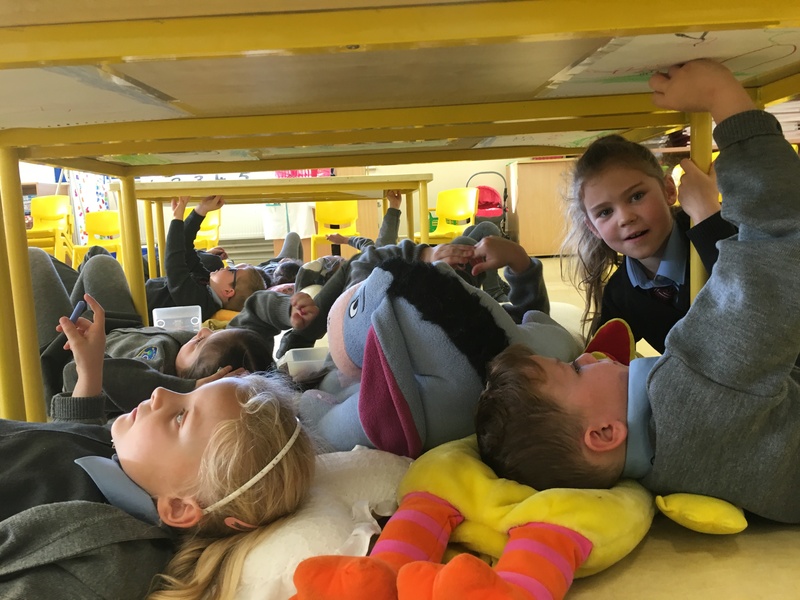 Just like Michelangelo we lay on our backs under the tables to create our very own masterpieces!! 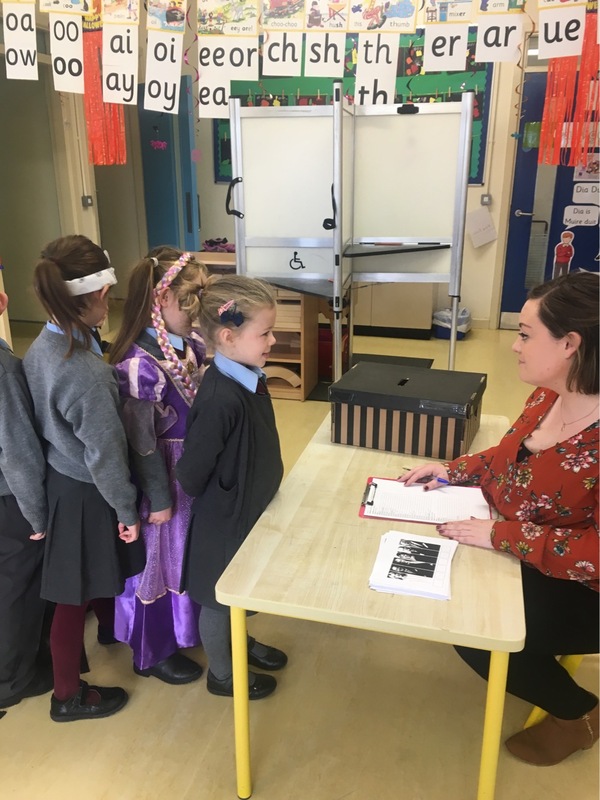 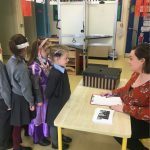 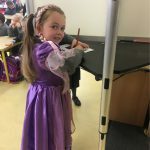 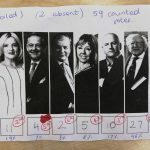 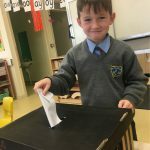 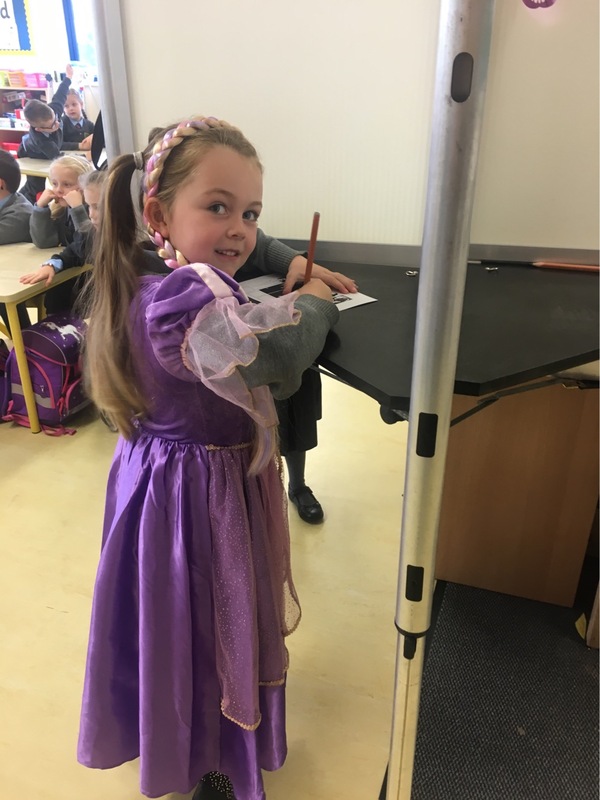 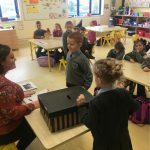 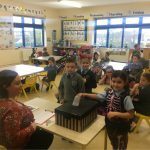 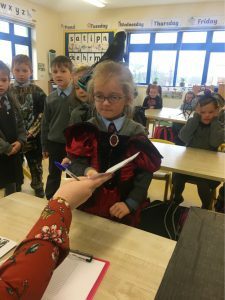 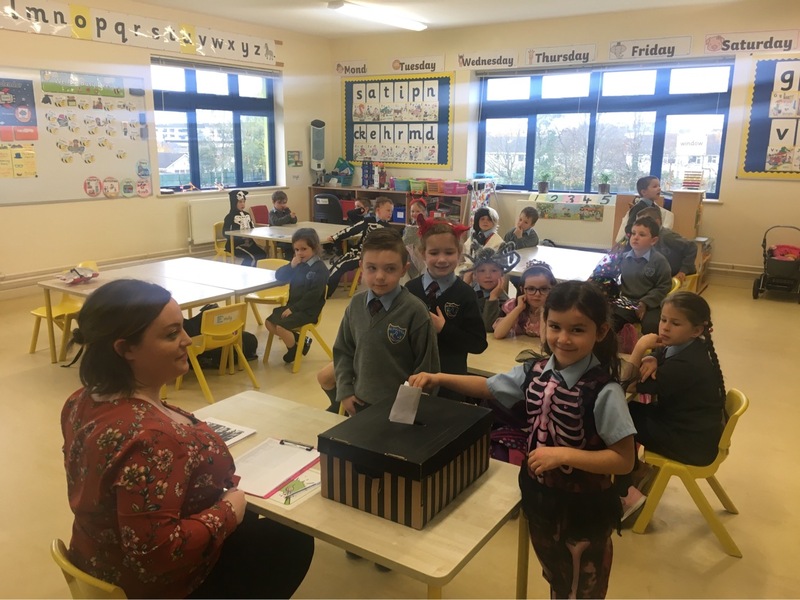 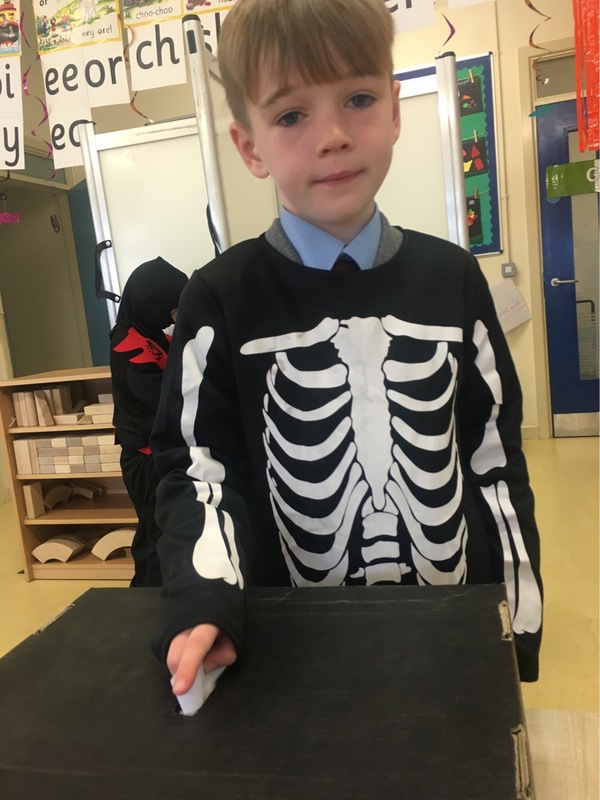 On the day before the Halloween midterm Senior Infants took part in a mock Presidential Election! 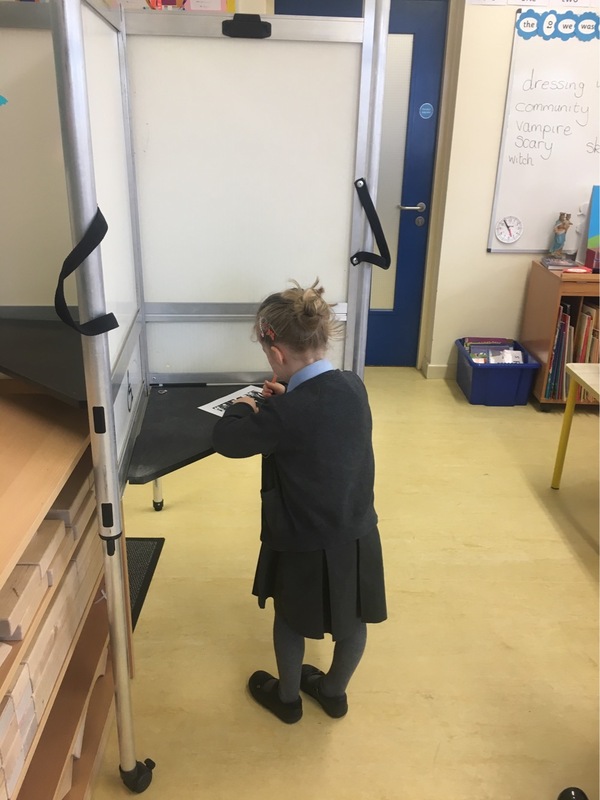 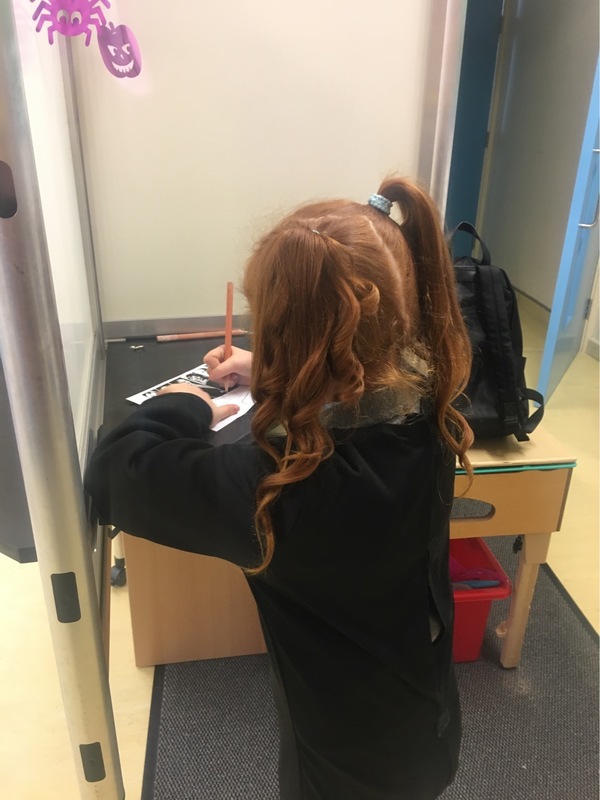 We had a registrar, voting slips, polling station and ballot box. 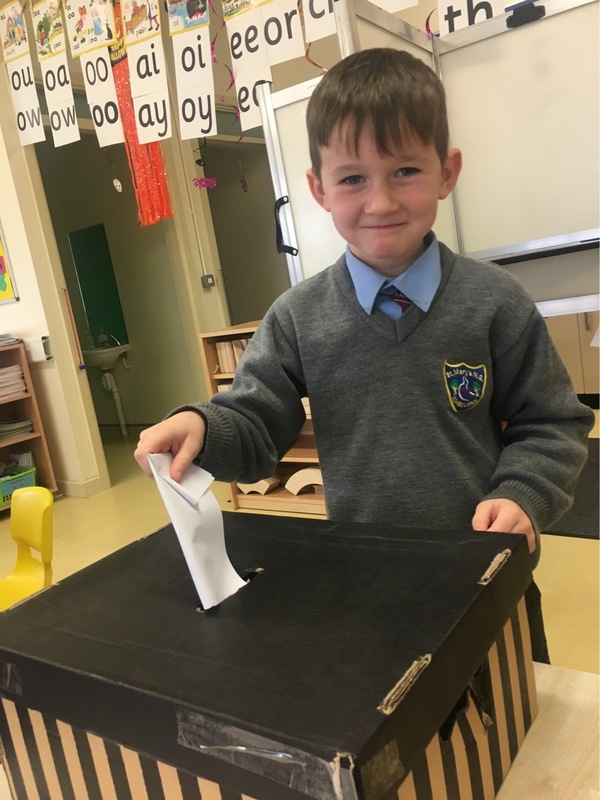 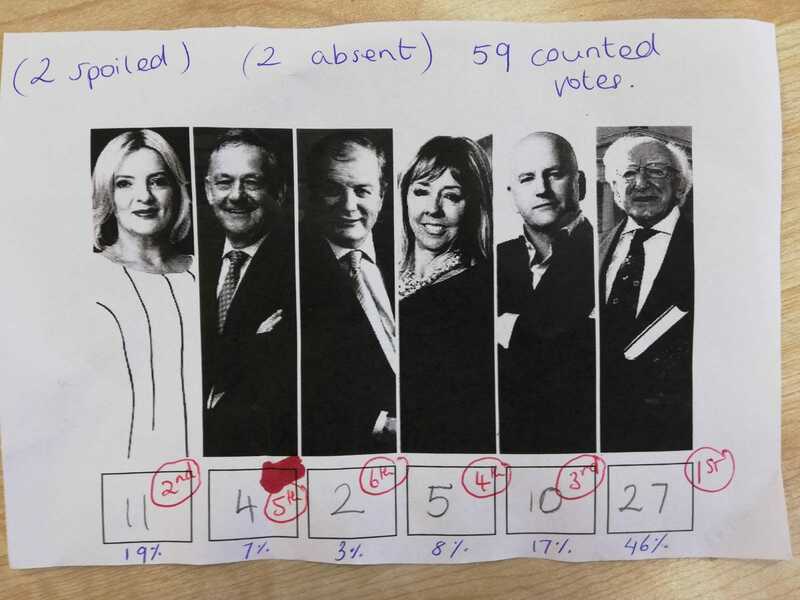 Like the rest of Ireland St. Mary’s Senior Infants voted Michael D. Higgins as their president. 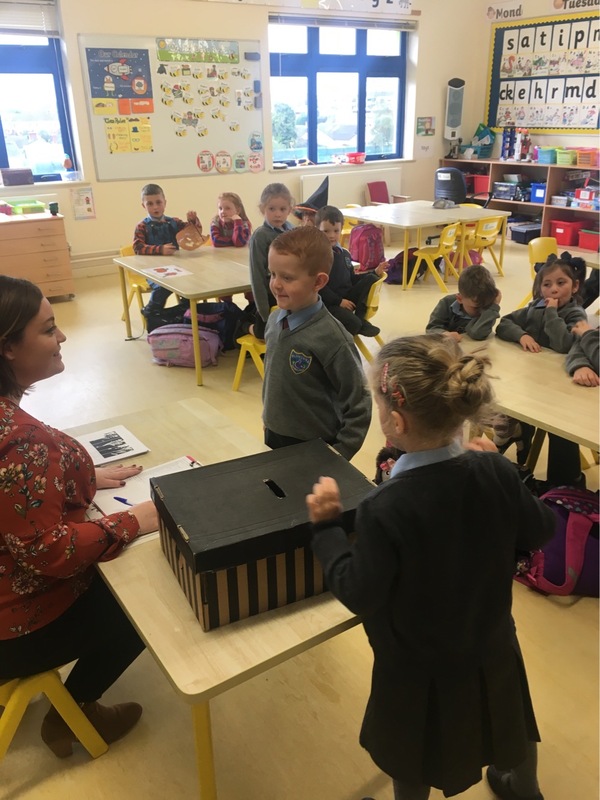 While children were waiting to vote they played Halloween games with Ms. Wylde and Mr. O’Bradaigh! 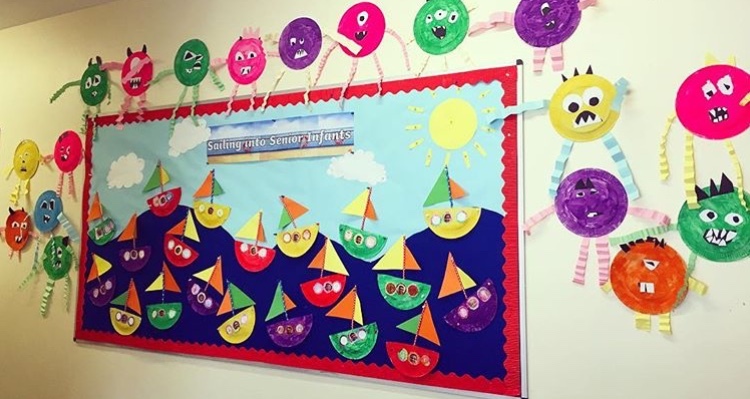 Here are some of our Halloween decorations and arts and crafts!